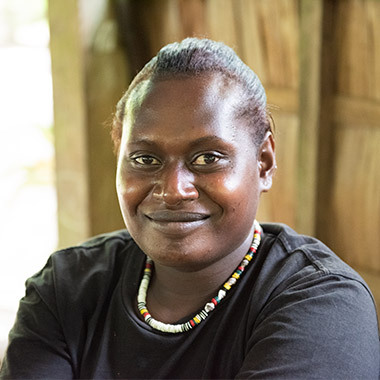 Women’s Wealth is an art project that engages with the ongoing importance and richness of women’s creativity within the predominantly matrilineal societies of the Autonomous Region of Bougainville and nearby provinces of the Solomon Islands. 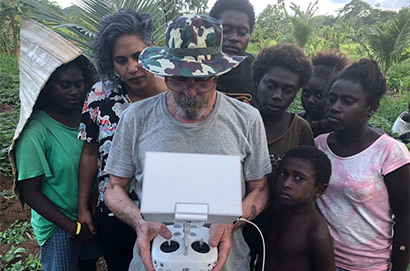 The project was launched on Buka Island in April 2017 and presented as part of ‘The 9th Asia Pacific Triennial of Contemporary Art’ (APT9) in Brisbane from 24 November 2018 to 14 July 2019. The Asia Pacific Triennial of Contemporary Art (APT) is the Queensland Art Gallery | Gallery of Modern Art’s flagship, internationally recognised exhibition series. This website is dedicated to the late Carol Haleha Golu. Women’s Wealth is a collaboration between the Queensland Art Gallery | Gallery of Modern Art (QAGOMA) and three Buka women: co-curator Sana Balai and artists Taloi and Marilyn Havini. 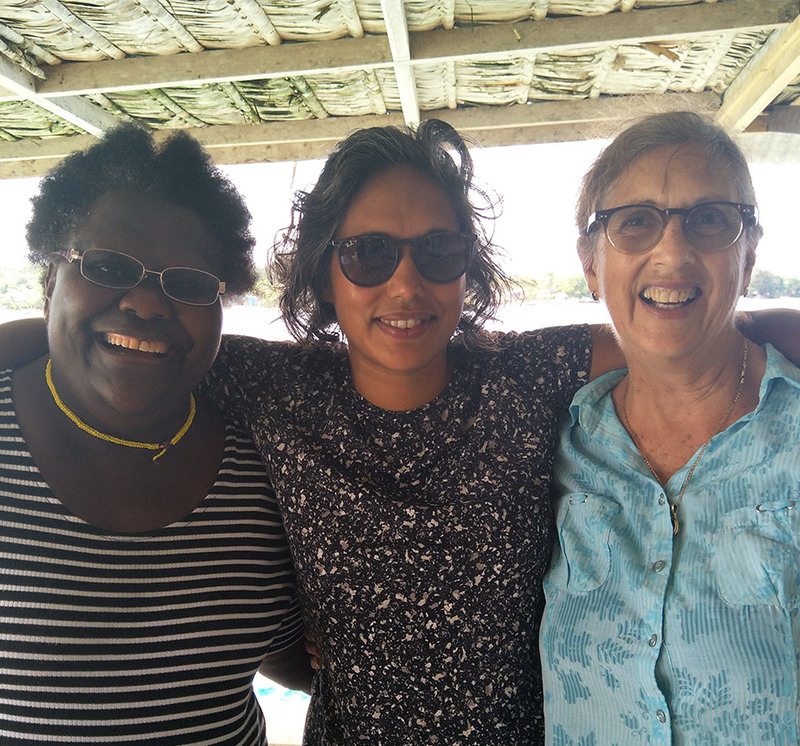 Inspiration for the project originated in these women’s shared dream to develop more nuanced understandings of the Bougainville and Solomon Islands region, and to provide Bougainville women with opportunities to engage in new creative conversations. 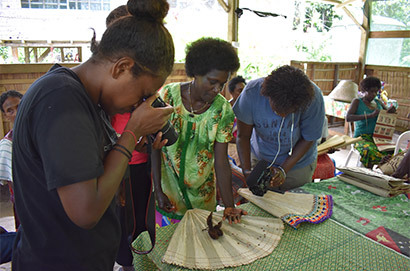 The project reconnects Bougainville women with artists from the nearby Solomon Islands. Although these regions share strong linguistic and cultural ties, they have been divided by political boundaries. 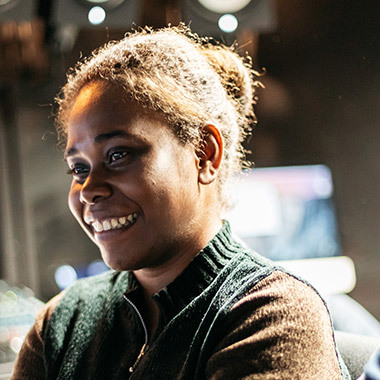 Four artists from the region who live in Australia and work in similar media have also participated in Women’s Wealth, enabling exciting new conversations between First Nations peoples across the three countries involved. 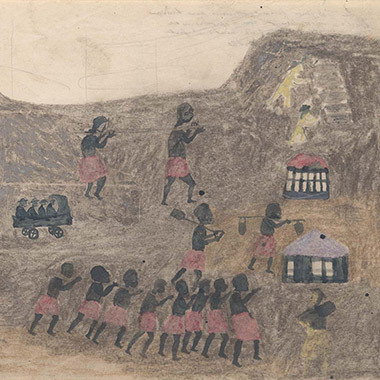 A small group of drawings documenting social change in the Autonomous Region of Bougainville, created in Gagan by Herman Somuk and Gregory Dausi Moah between the 1930s and 1970s, accompanies the project, as well as paintings from the ‘Images of the Crisis’ series of workshops developed by the Papua New Guinea Red Cross in Bougainville in 2012. All of the artists involved not only honour significant cultural forms but also experiment with new materials and presentations in order to increase audiences’ understanding of this region, its culture, its history and its people. The Autonomous Region of Bougainville comprises two main islands, Bougainville and Buka, as well as many smaller islands and atolls. Archaeological, linguistic and historical studies demonstrate that the region is not composed of isolated and remote landforms but is an archipelago where people, place and ideas continue to be linked by the sea. Some of the longest and most enduring connections are to the peoples, cultures and lands of the Solomon Islands archipelago: in fact, the region was for a time known as the Northern Solomons Province. Communities throughout this region were connected and extended through long-distance voyaging. Some of the earliest voyages, starting around 1000 BCE, were made by Lapita peoples sailing eastwards from Taiwan across the Pacific. By the eighteenth century the region’s population was a complex mix of cultural and linguistic groups, all with strong ties to the ocean. Movement across the warm waters of the Pacific continued in canoes, with peoples travelling between chieftainships as part of extensive exchange networks and warfare. Bougainville, the largest island in the Solomon Islands chain, was named after French explorer Louis Antoine de Bougainville. The island was taken over by the German administration in 1885 and became part of German New Guinea. For centuries, fertile volcanic soils have supported thriving plantations of copra and cocoa on the island. Bougainville is also minerally rich with large deposits of gold and copper that in the late 1960s led to the creation of a large mine known as Panguna. 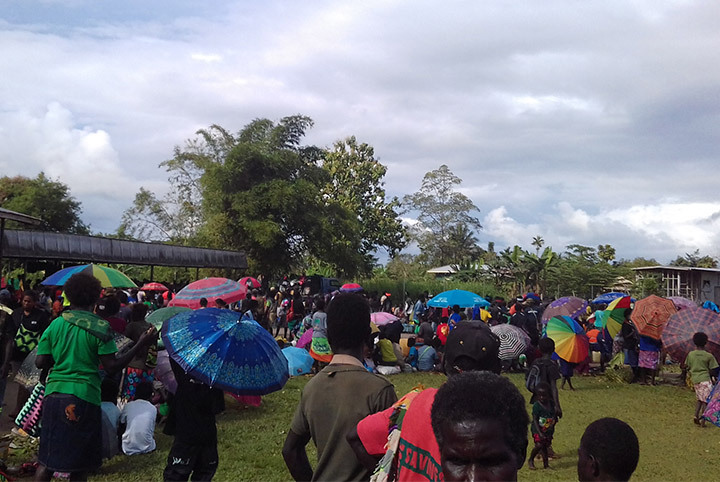 Tensions between landowners and the mine’s owners Bougainville Copper Limited over royalties and environmental concerns erupted in the late 1980s into a decade-long war and blockade that claimed tens of thousands of lives. Today, visitors to the island remark on the natural beauty of its shallow reefs and white-sand beaches, its powerful river systems and towering mountains looking out over islands and natural harbours. 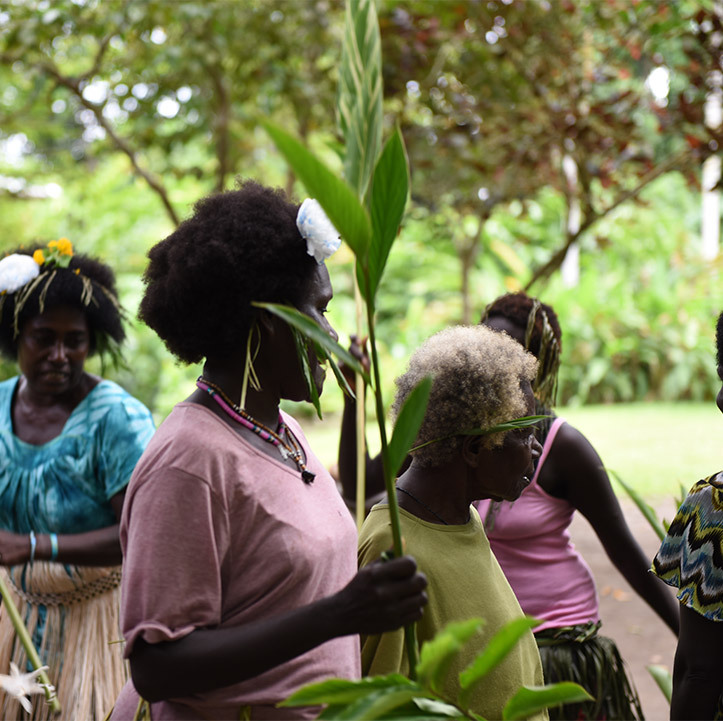 Culture continues to play a key part in everyday life in Bougainville in the form of traditional rituals surrounding birth, death, marriage, reconciliation and initiation. A range of cultural events still take place on the island and are a great way to experience this region’s unique traditions. A former administrative capital, Arawa was a bustling focal point of mining business when Bougainville Copper Limited’s Panguna mine was in operation from 1972 to 1988. Built on the site of the former Arawa plantation, this well-appointed town and its surrounding infrastructure of ports was heavily impacted by the war. 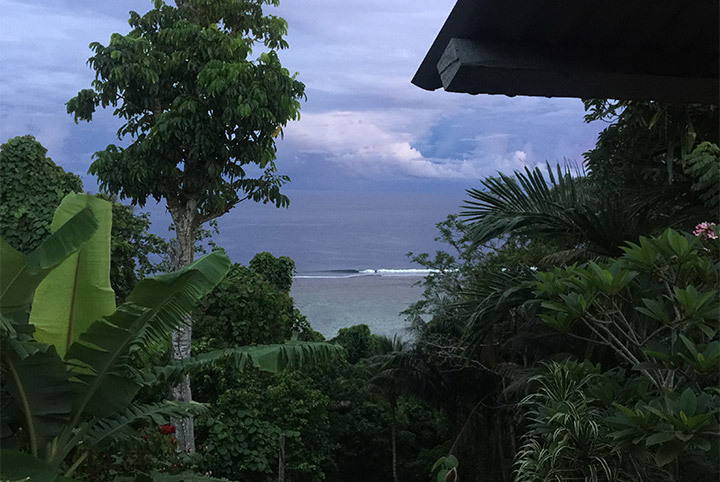 The adjoining town of Kieta and its stunning coast is often spoken of as part of a combined Arawa-Kieta. Locals say that it was once the jewel of the Pacific, featuring a public library as well as hotels and restaurants taking advantage of its sweeping views across to Pok Pok island. Arawa-Kieta is currently being rebuilt and may become the region’s capital once again. 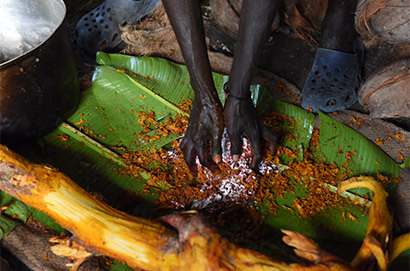 The area is known as the site of annual festivals celebrating the district’s cocoa producers, for its enthusiasm for heavy metal music and for the iconic biruko fan made by Nasioi women from surrounding villages as ornaments for cultural gatherings and anniversary days. 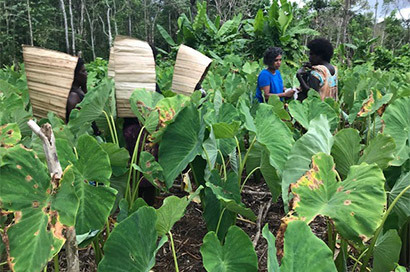 Located behind the Crown Prince Range in the centre of the Buin plane in the South of Bougainville, Siwai is renowned for its agricultural produce and traditional architecture. Traditionally, the area comprised hamlets with houses made of wood, woven bamboo walls and sago-leaf roofs. Pottery, woven basketry and beautiful body adornments made from shells are all still made by talented artists living in neat and quiet villages in the region. Located at the southernmost end of Bougainville Island, Buin is the regional capital of the South Bougainville District. The area was occupied by the Japanese Imperial Army during 1942, who established a fully fortified military base, known as Little Tokyo, in the south of the town. Now covered in jungle, this rabbit warren of huge cement bunkers was designed to allow light planes to take off and land on it. In 1943, Admiral Isoroku Yamamoto plunged to his death over Buin when his G4M ‘Betty’ bomber was shot down by an American squadron. 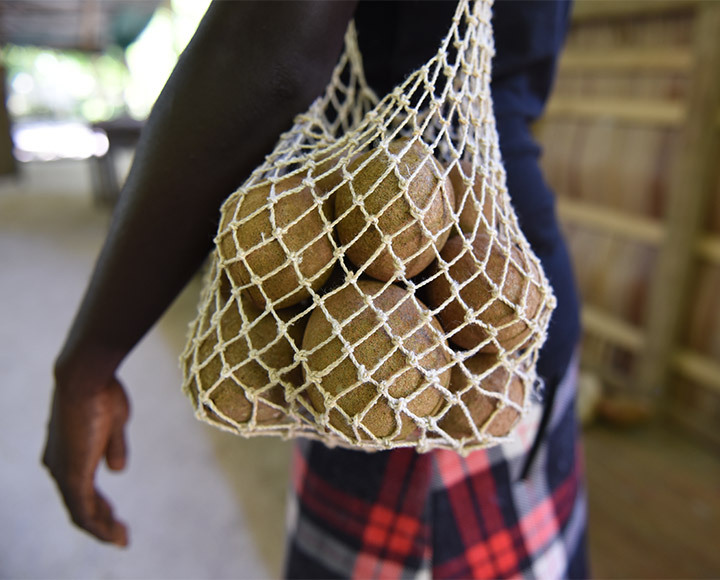 Today Buin is a thriving regional hub with weekly markets that draw traders from across the district and nearby islands, including Choiseul. 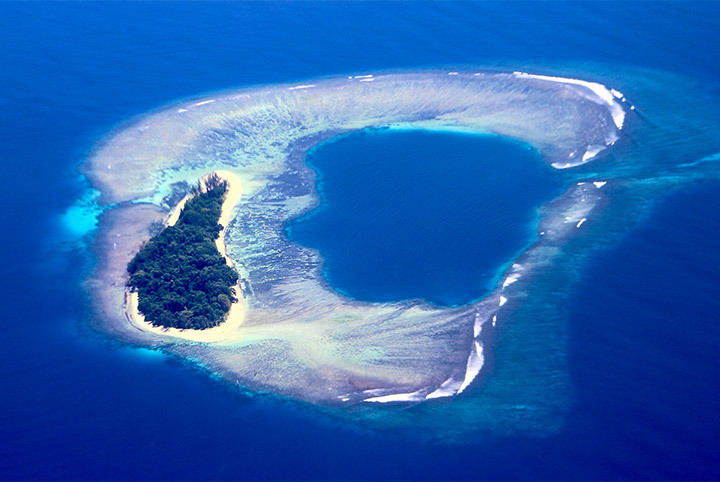 Buka Island is positioned north of Bougainville and separated from it by a narrow but extremely deep ocean passage. The entire eastern coast of Buka Island features a limestone cliff face that rises 245 metres above sea level, above the reef of an ancient lagoon. Over millennia, the movement of underground rivers has created caverns and subterranean springs accessible via large caves open to the sea. These caves provided makeshift homes for many of the island’s population during World War Two as they sought to escape intensive bombing raids by United States squadrons based on nearby Nissan Island. 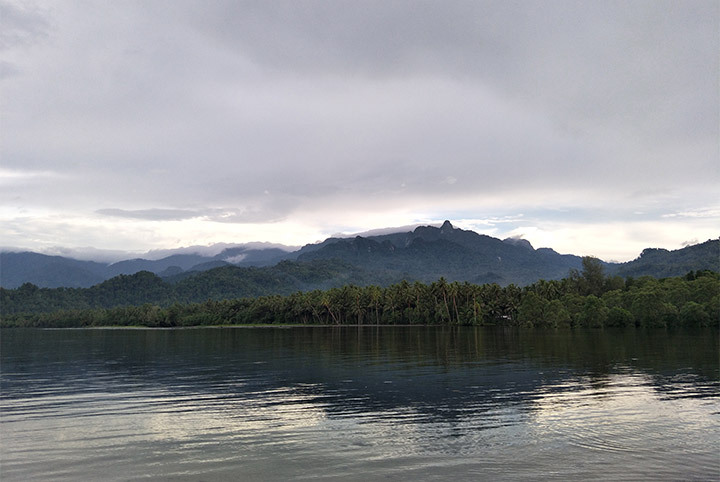 Running along the western coast of Buka Island is a small mountain range known as the Richard Parkinson Range — named after the German planter and explorer. 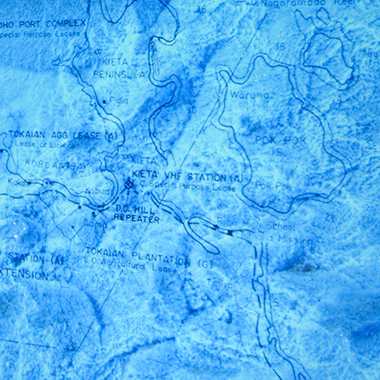 Within this range is the township of Gagan, where the first man and woman of North Bougainville are considered to have lived, from whom all of the region’s four clans descend. It is also home to the upper tributaries of one of the island’s Iargest rivers, the Gagan. A Catholic mission was established in this Solos-speaking area in the early 1900s, and an impressive church was built and decorated there by local artists during the 1970s. Smaller atolls pepper the northernmost fringes of the Autonomous Region of Bougainville’s oceanic boundaries. 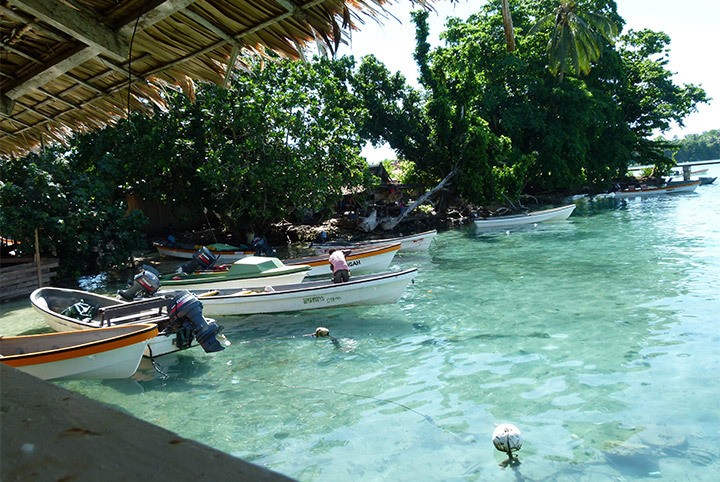 Local people are sustained by the sea and the natural resources found on their island homes. The Carteret Islands region was the first place in the world to require population relocation due to sea-level rises caused by climate change. 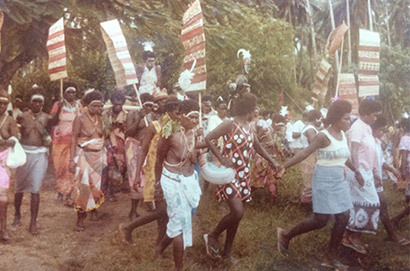 The islands group making up Choiseul Province in the Solomon Islands has strong historical and cultural connections to Bougainville. Like Bougainville, Choiseul Province was initially part of the German Solomon Islands, before being ceded to Britain in 1899, becoming part of the British and then Independent Solomon Islands. The largest of the islands in the province is Choiseul (native name Lauru). 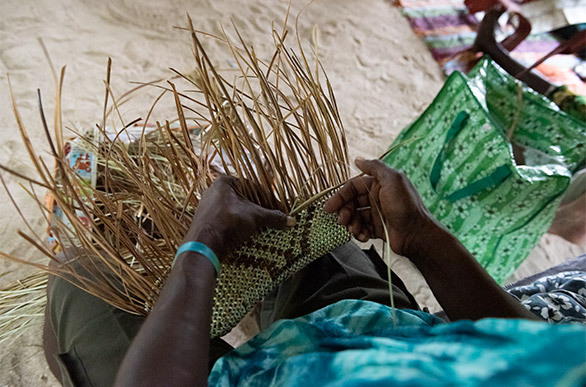 On this island a number of distinctive traditional cultural practices continue, including the knotting of string bags and creation of low-fired earthenware pots. 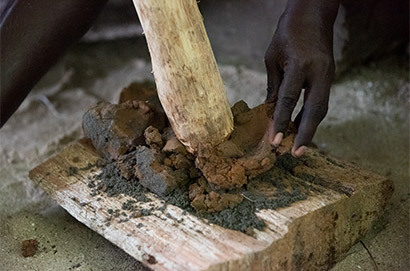 Choiseul is one of the few areas from ancient times where pottery continues to be produced. In recent years, Bougainville-born, Sydney-based artist Taloi Havini has drawn international attention for her art which engages with the history and culture of her homeland. Havini works across photography, ceramics, video and immersive mixed-media installations, and is inspired by the knowledge and governance systems of the people of Bougainville. She collaborates with other cultural practitioners and draws on archives and museum collections to demonstrate the resilience of Bougainville peoples and culture in the face of significant historical change. Elisa Jane Carmichael belongs to the Ngugi clan of the Quandamooka people of Moreton Bay in south-east Queensland. 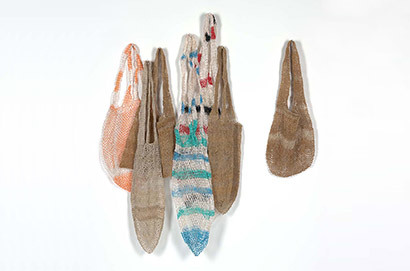 Carmichael is equally at home working in fashion or the visual arts, and her paintings and textile creations honour the culture and landscapes of Minjerribah (North Stradbroke Island) by incorporating materials collected from country and utilising traditional techniques. She comes from a family of artists and curators and works closely with female kin to revive, nurture and preserve knowledge and cultural practices almost lost as a result of missionary activity on the islands. 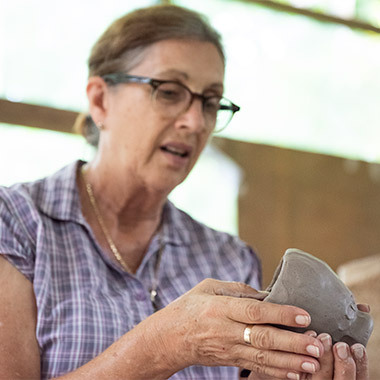 Janet Fieldhouse was born in Cairns, Far North Queensland, and creates contemporary ceramics inspired by her Torres Strait Islander heritage and engagement with other First Nation peoples. 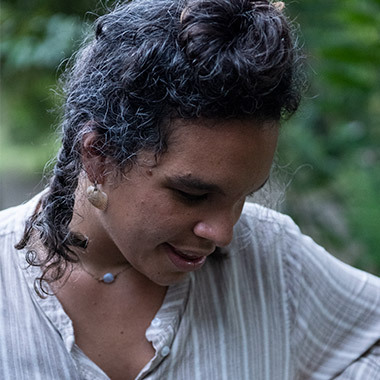 She works confidently in porcelain and other earthen media, marrying ideas of preciousness and practicality to communicate the sophistication and functionality of indigenous material creations — from everyday baskets and fishing hooks to body adornments. 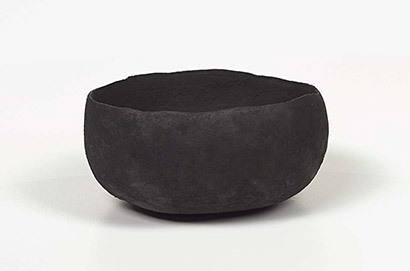 Her works are often large-scale and combine a number of ceramic forms in a delicate balancing act. 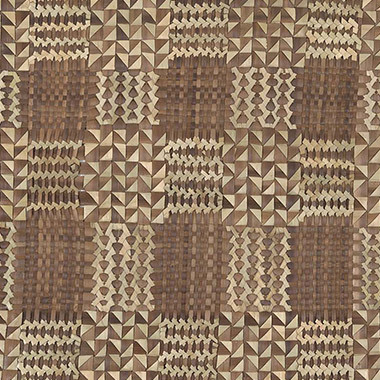 Kay Lawrence AM is widely acknowledged as a founding figure in contemporary Australian textiles. 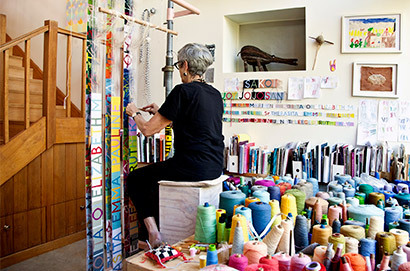 She is highly regarded for works ranging from large-scale handwoven tapestries to multimedia textile installations. Lawrence has led a number of community textile projects, such as Canberra’s Parliament House Embroidery 1988, and taught for more than 20 years, including as Head of the South Australian School of Art. 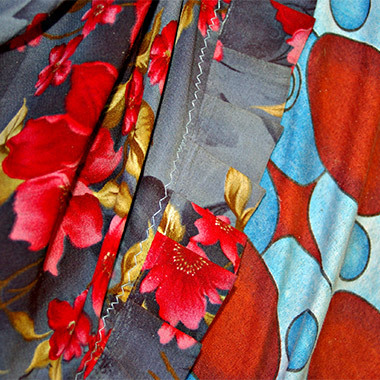 She is particularly interested in exploring the relationship between textiles and gender, place and community. 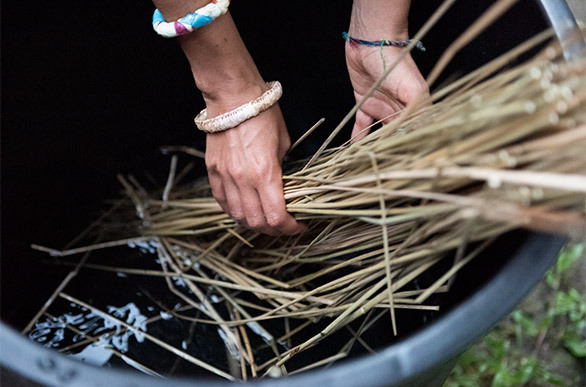 Lawrence has collaborated with a number of Indigenous communities to develop projects utilising traditional textile practices to record connections to place and creatively respond to contemporary issues. 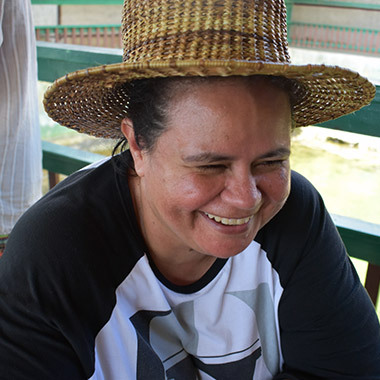 Joy Wongatina Pazabeto Madada works primarily with knotting and weaving techniques she learnt at a young age, and is passionate about maintaining material practices that express cultural and gender identity, such as the making of kuza (string bags). 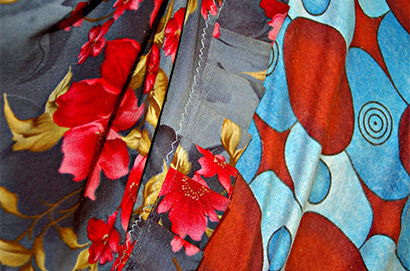 By incorporating innovative pattern and colour with traditional natural fibres and nylons, Madada engages a younger generation in preserving customary techniques, knowledge and forms. 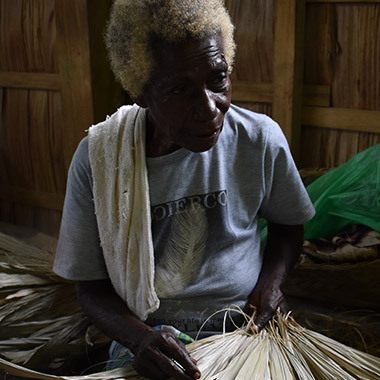 She is a master weaver from Lengatura village in the East of Choiseul Province and has represented the Solomon Islands at festivals and workshops in Fiji and Honiara. 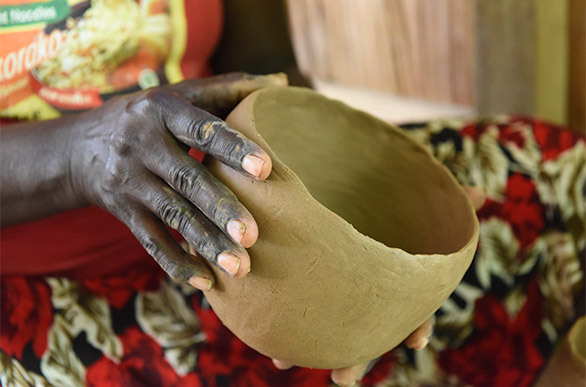 The creation of earthenware pots, once made on many islands in the Solomon Islands archipelago, now survives only in the village of Sirovange on Choiseul Island. Imelda Vaevavini Teqae married the nephew of one of the last practising potters in this village and has subsequently been given the closely guarded knowledge needed to create the elegant blackened pottery forms traditionally used for cooking and storing food in this locale. 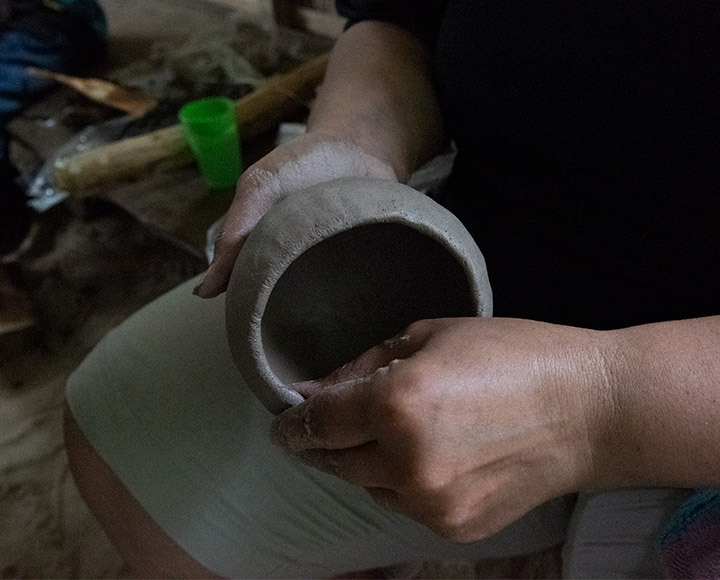 Teqae works with locally sourced clays and sand to create pots used in the village and sold at local markets, at times creating sculptures inspired by other local cultural forms, such as the canoe. 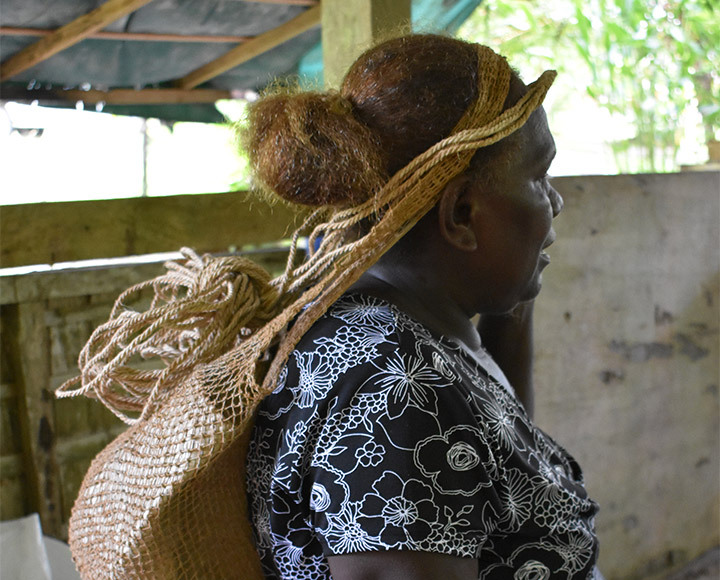 Living and working in Sasamunga village in the south of Choiseul Province, Gwendalyn Dava Damusoe is a textile artist known for her skill in creating the traditional kuza (string bag). 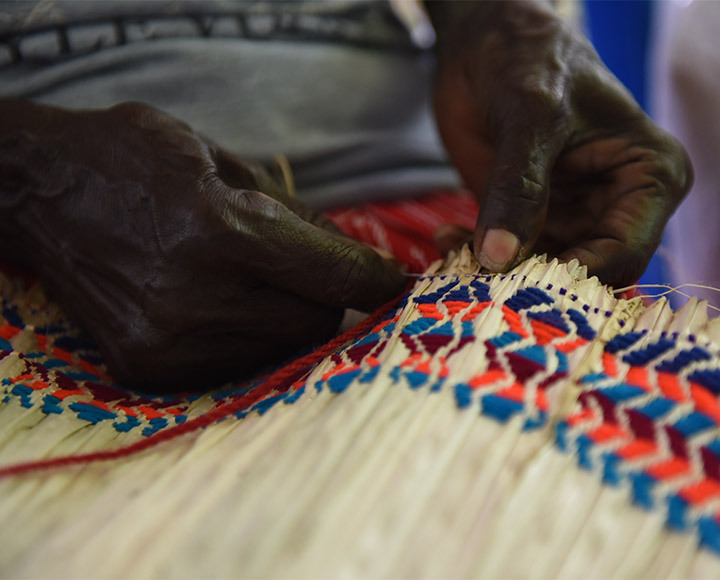 Under the guidance of her mother, Damusoe learnt how to source materials and knot these textiles at a young age, and now produces works for sale at the local office of the Choiseul Provincial Council for Women, as well as at festivals in the capital of Honiara and overseas. 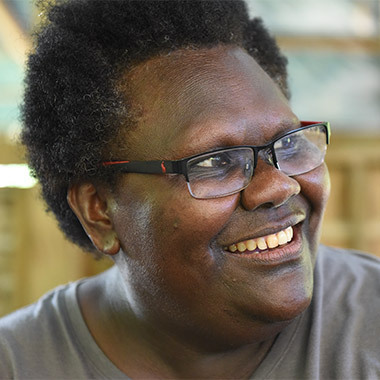 Georgianna Maetale Lepping is an actor, journalist and media artist who co-founded the Solomon Islands Film Group with her sister, Regina. 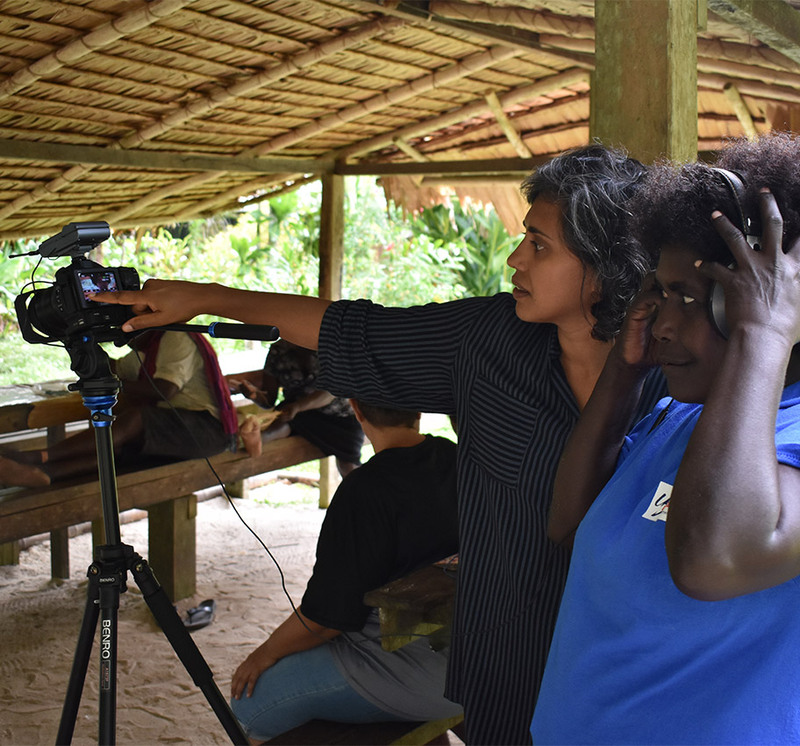 This intergenerational collective of people from throughout the Solomon Islands are interested in using filmmaking to record their stories. Members share scripts and host screenings with each other, and work with fiction and documentary traditions. 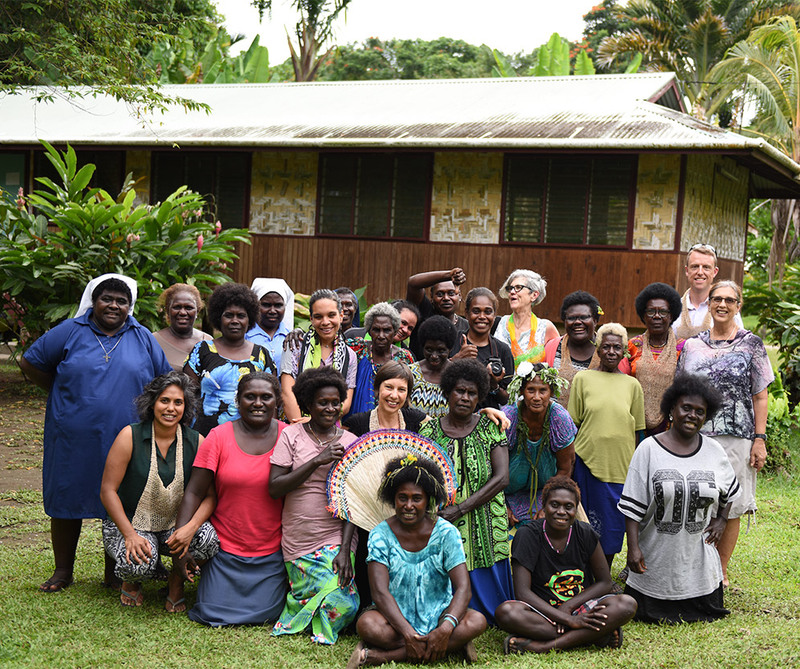 Lepping recently collaborated with theatre group Stages of Change to raise awareness of issues around education, health, governance, the environment, youth and gender within remote communities. She descends from a chiefly line in the Shortland Islands through the Solomon Islands’ second Governor General, Sir George Lepping. 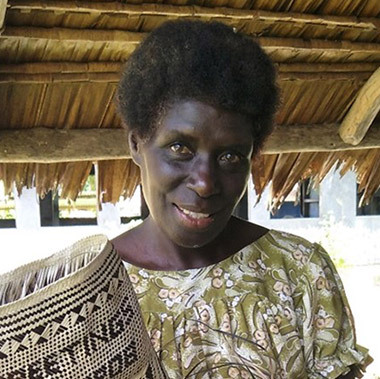 Kiria Blandina Asike is a senior textile artist widely recognised within the Hakö region of North Bougainville for her cultural knowledge and artistic skill. She was born in Hangehe village, and lives and works as an artist and subsistence farmer in the nearby village of Tanake, on the eastern coast of Buka Island. Asike’s female relatives taught her about the meanings and importance of Tuhu capes and other textiles for clan ceremonies associated with birth, death and the bride price tradition. She is one of only a few women who still know how to source and prepare the materials and are familiar with the techniques required to make these sculptural capes. 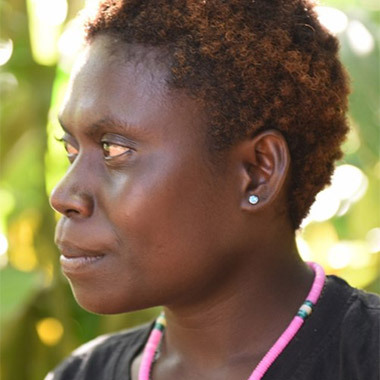 Jesmaine Sakoi Gano is a young Hakö woman who lives the North Bougainville community of Ngakubul on Buka Island. Gano is the granddaughter of revered Methodist pastor-teacher and Naboin Paramount Chief Jonathan Havini. 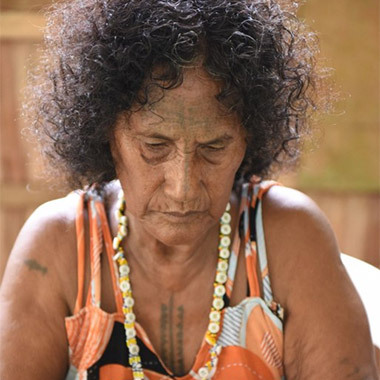 Her maternal grandmother Miriam Hikani was from the Nakas chiefly line, and Gano is charged with community responsibilities associated with being part of this family. She was introduced to the video medium in 2011 through a Pacific Black Box project led by Taloi Havini. Working predominantly in documentary mode, Gano engages with a range of subjects, from her fellow youth to community elders, recording their stories with warmth and a respect that increases their sense of agency and authority. 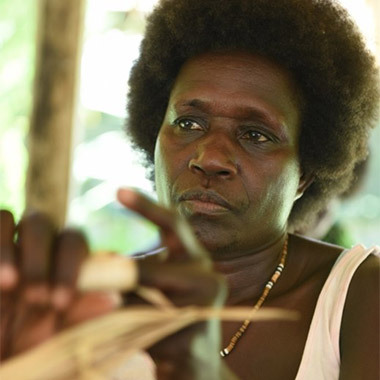 Elizabeth Gawa Marata is a basket weaver from the Selau-speaking peoples of North Bougainville widely recognised for her innovative explorations of traditional techniques and materials. 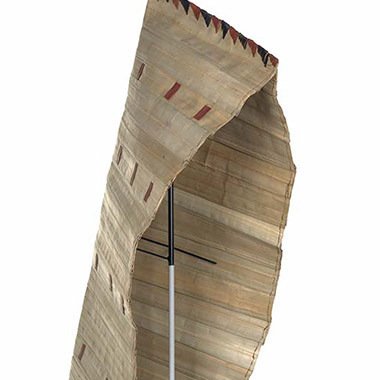 She is inspired by the distinctive shape of coconut-leaf men’s baskets made by the Gunantuna people of East New Britain, and is one of a number of weavers who experiment with traditional cane-weaving techniques to create a new, local expression of this form. 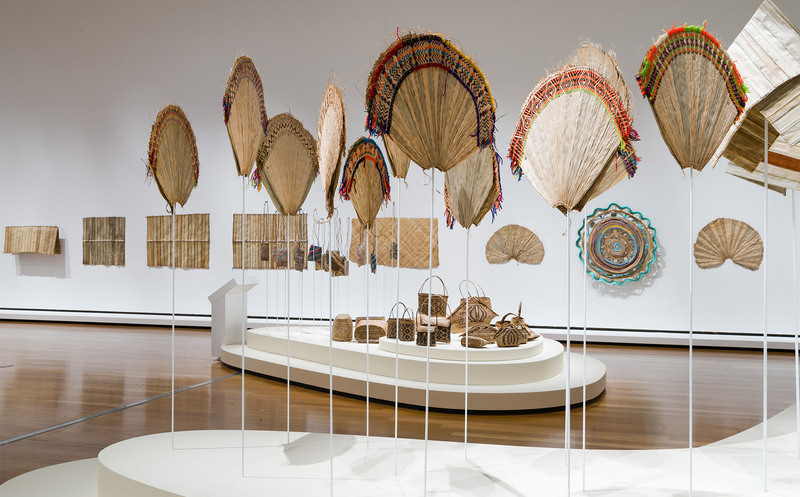 Marata includes decorative elements in her baskets — including iconic images such as Upe (men’s ceremonial headdress) — as well as text that firmly identifies them as expressions of Bougainville culture. 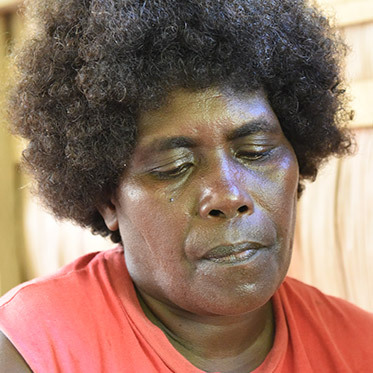 Elizabeth Watsi Saman is a Naboin clan elder who lives and works in the Selau region of North Bougainville, not far from the Nazareth Rehabilitation Centre at Chabai where the Women’s Wealth project was held. Saman draws on knowledge and techniques she learnt at a young age to create Tuhu capes decorated with patterns relating to her clan. 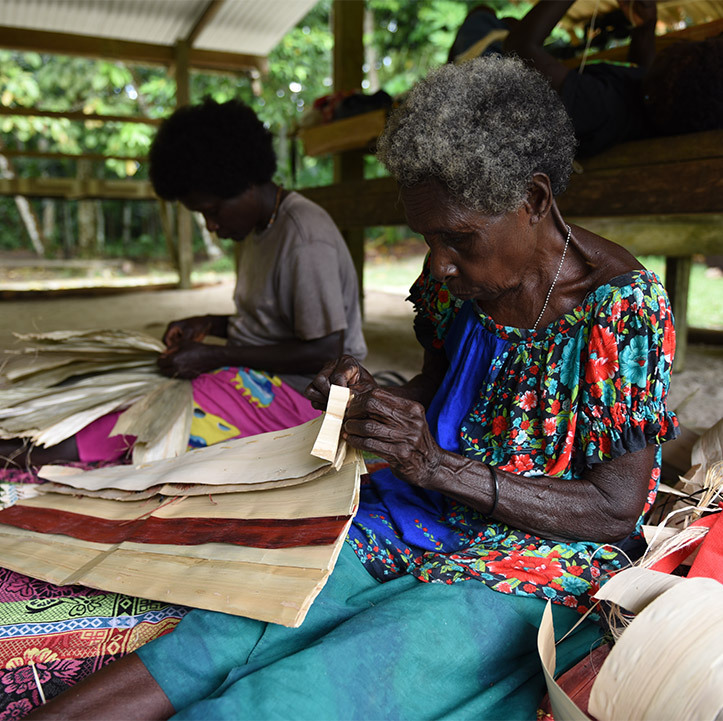 Gifted weaver Sister Theresita Alona was born in the Siwai area of South Bougainville and belongs to the Banoni people of this area. 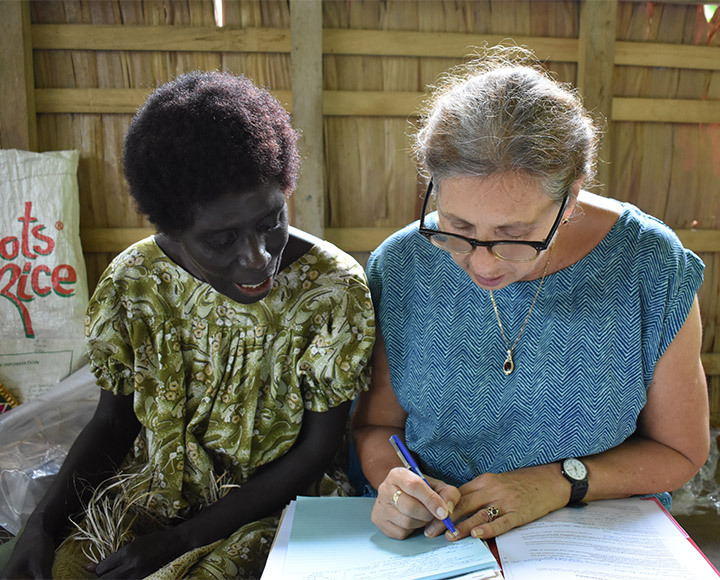 She joined the Sisters of Nazareth in 2003, and currently is one of the senior nuns living and working at the Nazareth Rehabilitation Centre, a safe house for women and children at Chabai in North Bougainville. 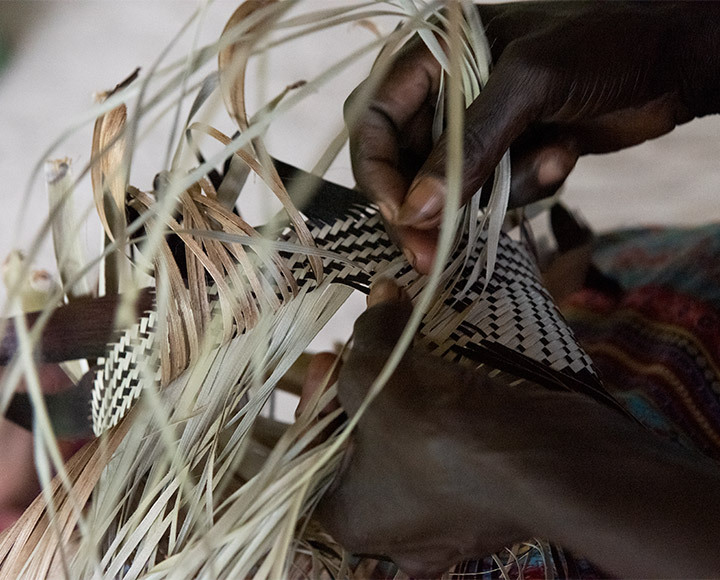 In addition to her duties at the centre, Sister Alona continues to weave baskets used at the centre and sold to raise funds. Helen Dusimoi Miriona is inspired by the textile traditions of the Nasioi people of Central Bougainville, from whom she descends. 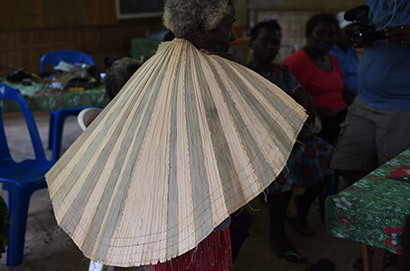 One of the most significant and iconic forms from this area is the biruko, a fan-shaped textile once used exclusively by Nasioi women as a symbol of womanhood, but is now also used by other Bougainville women as an indicator of cultural identity. Miriona decorates her biruko with not only traditional patterns worked in natural fibres but also bright, commercially available wools to create the optimum optical effect. Adelaide Mekea Aniona belongs to the Nasioi people from Moroni, an area directly impacted by the creation of the Panguna mine on Bougainville Island and the civil war that followed. 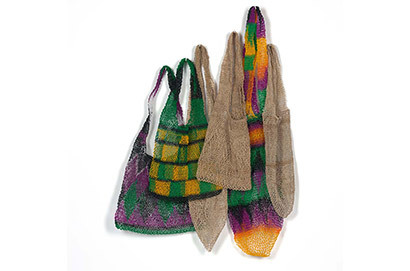 Aniona was born in the late 1930s and received a traditional village upbringing during which she was taught how to create a range of textiles as part of her initiation into womanhood. 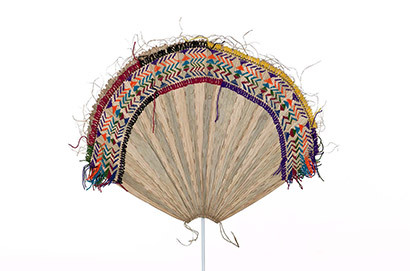 This event was marked by a long period of seclusion in a hut, culminating in her being granted permission to wear the biruko fan-shaped textile. 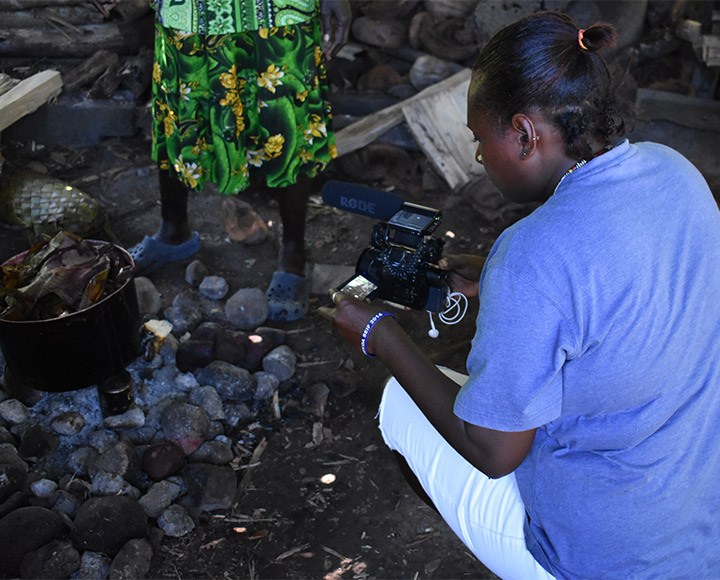 Now an elder within her community, Aniona continues to educate young women about the meaning and importance of this cultural form. 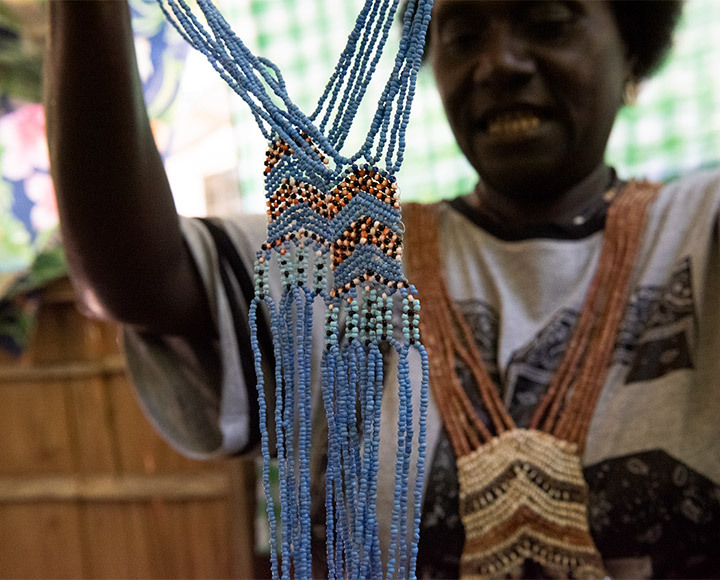 Pauline Kimei Anis is known primarily for the creation of beaded jewellery inspired by traditional body adornments created in the Siwai area of South Bougainville. Customarily made from shells, these ornate adornments were worn by women as a harness across the chest and back in bride price ceremonies. Anis often works with commercial beads, experimenting with colour and pattern while maintaining the traditional form and purpose of the adornment within Siwai culture. These innovative works are sold and gifted within local communities and further abroad. 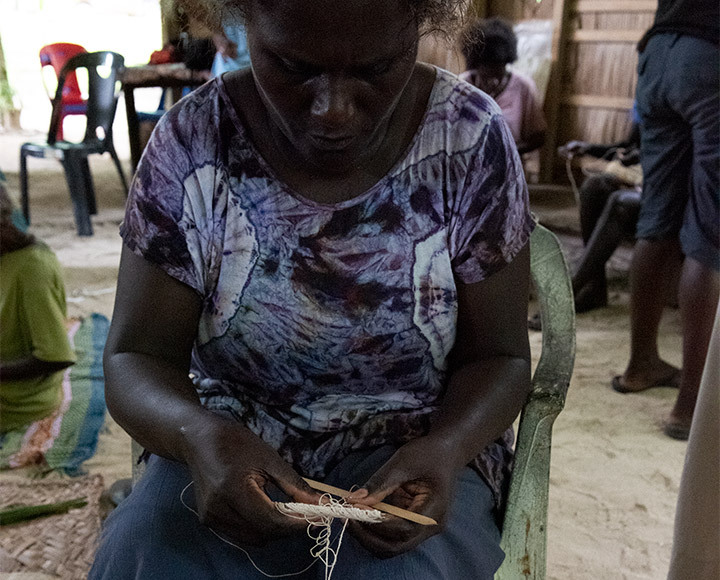 Emma Hopuhopu Makusu is a weaver from the Siwai area of South Bougainville who works with locally sourced natural fibres. 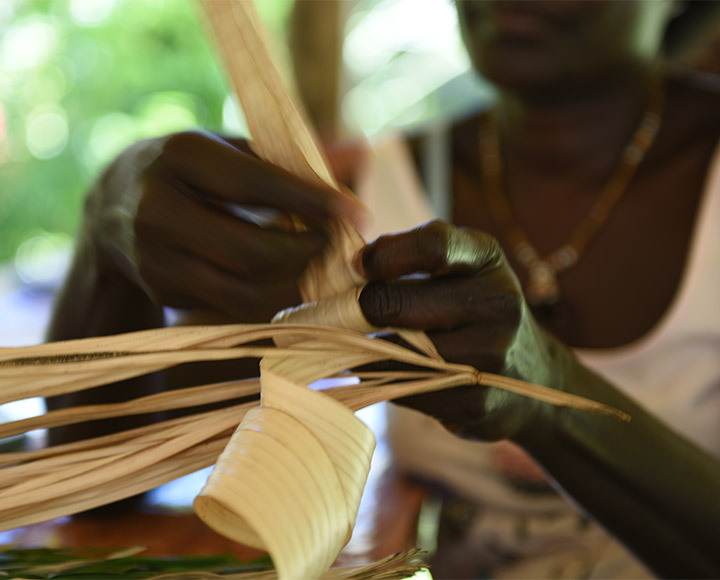 The baskets she creates are inspired by woven forms found in this area known as Solomons and Siwai baskets. 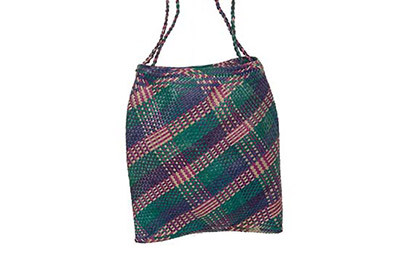 These textiles are worn as a fashion accessory or carry-all by women throughout Bougainville and are found readily at markets in town centres. 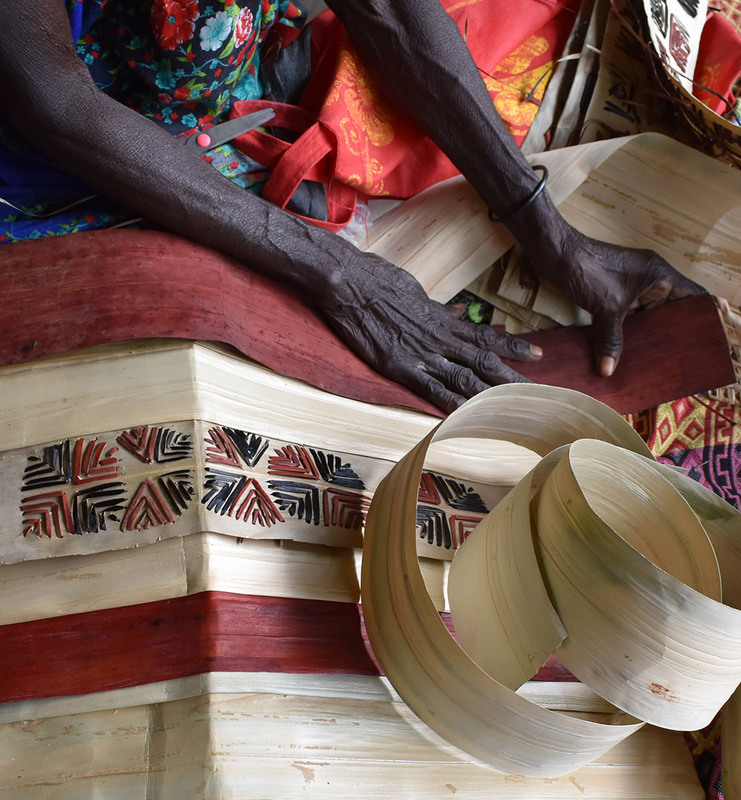 Makusu decorates her baskets with traditional patterns achieved by incorporating bark fibre of the black banana or by dying soft, carefully prepared coconut leaves with bright commercially available dyes. 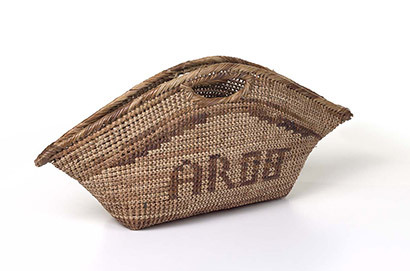 Other innovations include text woven into the bag recording the wearer’s name, the acronym AROB (Autonomous Region of Bougainville) or a local greeting. 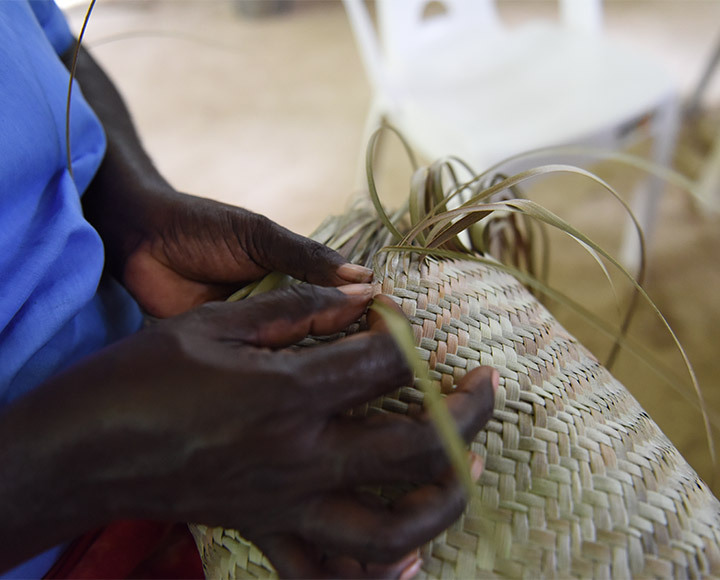 Josephine Manta Kepaku is a young artist who works with a variety of textile forms, from string bags and stitched mats to the woven cane baskets and trays traditionally only made by South Bougainville men. Kepaku descends from one of the few patrilineal societies on the island, a chiefly line from the Buin area of South Bougainville. 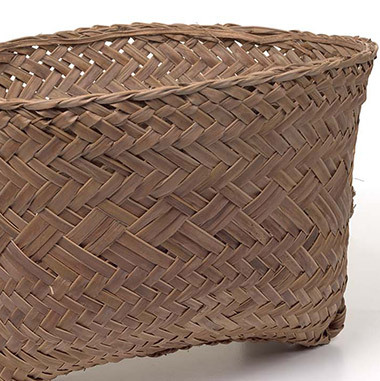 This is an area celebrated internationally for strong, woven cane Buin (formerly ‘Buka’) baskets created by men. 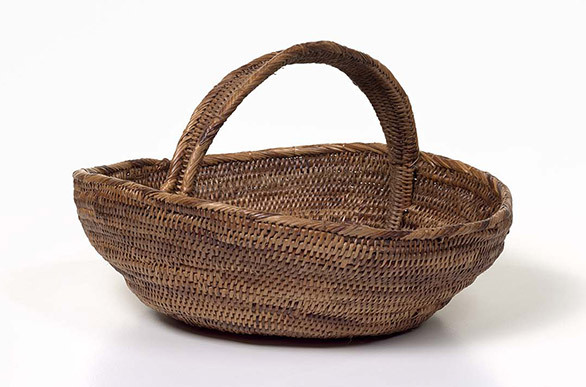 These baskets have more recently been imitated and adapted by communities in the Papua New Guinea Highlands. 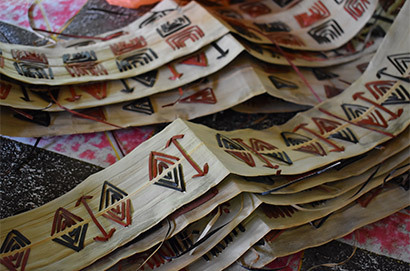 Supported by elders who seek to preserve the integrity of their unique cultural knowledge and practices, Kepaku collaborates with her uncles and aunts to learn and maintain the knowledge necessary to keep this art form alive and connected to place. 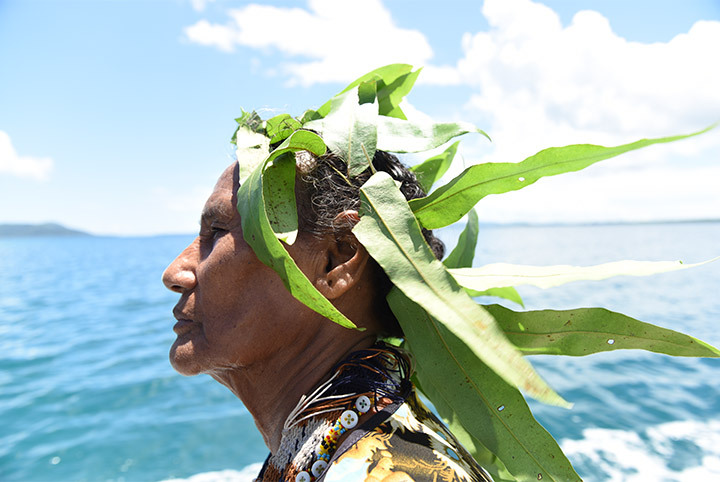 Aida Hilo Pais married into the region’s outlying atolls group and works exclusively with the cultural forms practised by her husband’s Nukumanu people. 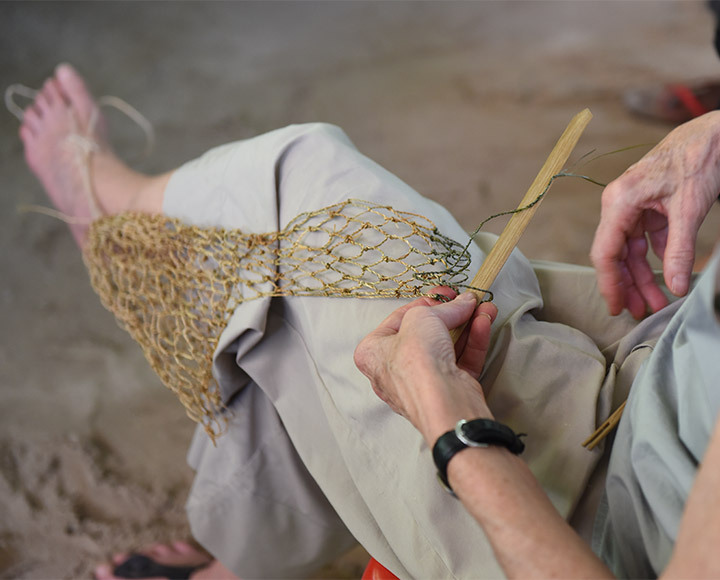 She uses both traditional and contemporary materials, moving skilfully from woven pandanus mats and coconut-leaf baskets to intricate beadwork. 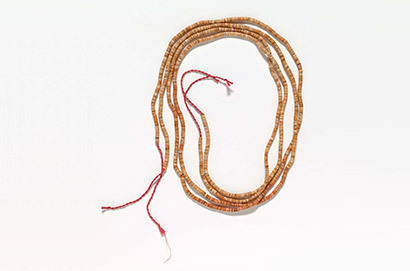 She often achieves dazzling, colourful patterns on her stylish belts worn by brides and pregnant women by using commercially available beads, but is equally at home plying coconut fibres into strong, caramel-coloured ropes used by men for lashing the framework of village dwellings and on fishing boats. 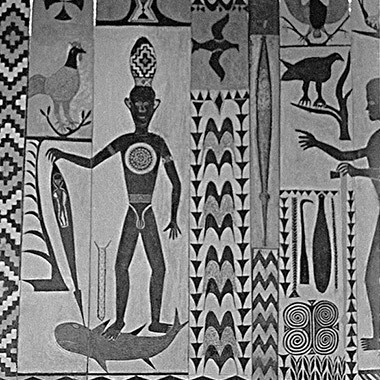 Herman Somuk (c.1901–65) was one of Bougainville’s pioneering artists. He started working in the 1920s with the support of Marist priests Father Lukan and Father Patrick O’Reilly, who visited Bougainville in 1934–35. 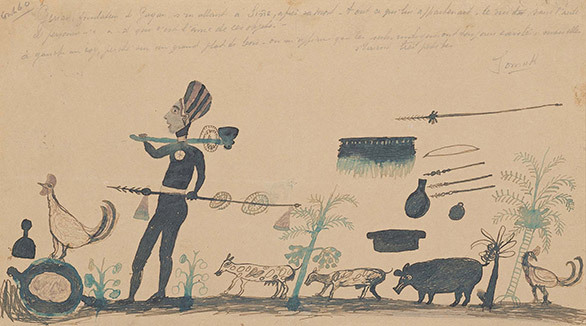 O’Reilly’s journal, Séjours à Bougainville, Îles Salomon 1934–45, in the collection of the Musée du Quai Branly, Paris, features 28 original drawings and two illustrated tales by Somuk. Many of Somuk’s drawings, now held in collections throughout Europe, document stories, customs and life in Bougainville between the wars and engage with Christian themes. 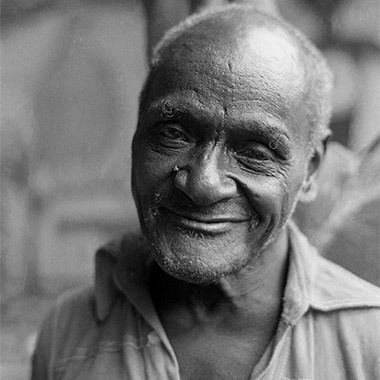 Gregory Dausi Moah (c.1901–88) was a Naboin man who lived in the village of Mokinaka in the Autonomous Region of Bougainville. 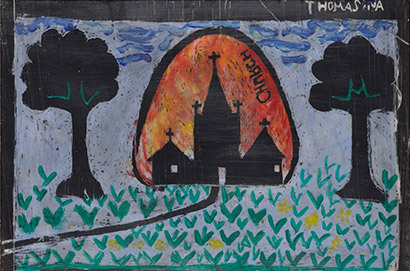 Moah was a self-taught artist inspired by his traditional elders and exposure to new mediums of expression by the nuns and priests of the nearby Gagan mission. He was the lead artist commissioned to build and decorate the local church and priest’s residence. 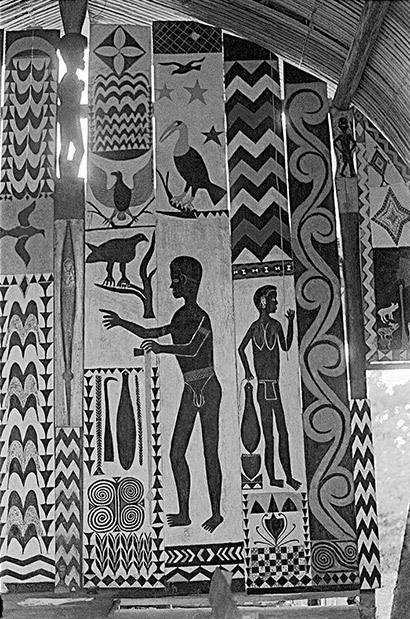 During the 1960s and early 1970s, Moah served on the Hutjena Local Government Council, established his own plantation business and was commissioned by the Bougainville Provincial Government to lead a group of men to carve totemic poles for the Aropa International Airport. In 1972, Moah was invested as a chief of his clan’s Tsuhana (clan house). Encouraged by Father Lukan, Moah built an innovative new Tsuhana decorated extensively with impressive painted storyboards and carvings memorialising significant ancestor figures and clan stories. The works in ‘Images of the Crisis’ were created as part of a project conducted in 2012 by the Papua New Guinea Red Cross, the University of Papua New Guinea and the International Committee for the Red Cross at four locations in the Autonomous Region of Bougainville. 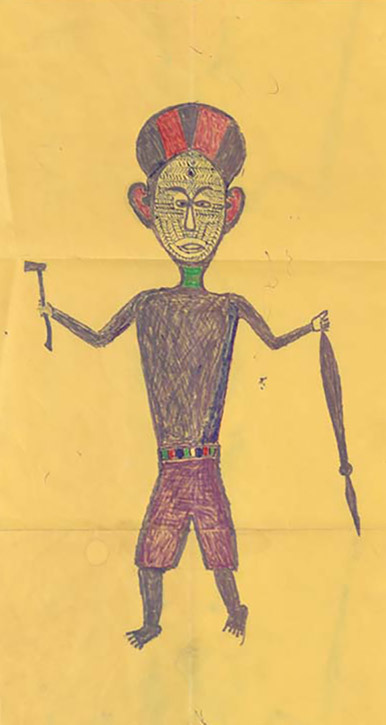 The workshops were at aimed at addressing ongoing trauma resulting from the regional crisis of the late 1980s and 1990s, and used Herman Somuk’s drawings as a teaching aid. A cross-generational group of women and men from Gagan, Buka, Rorovana and Buin who had no visual art training attended the workshops. Participants drew on life experience to create their compositions, experimenting with a reverse painting technique known as fixé sous verre (under glass). Sana Reana Tangere Balai was born second-in-line to the current woman chief of the Nakaripa clan of the Hakö peoples from Buka Island. 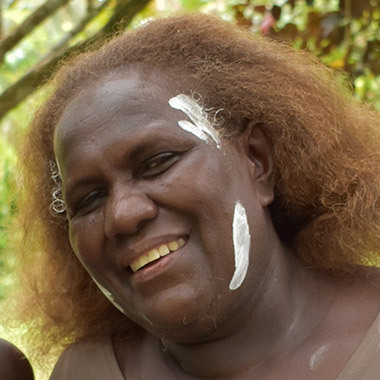 Balai was one of the last of her people to undergo traditional initiation rites, and is a holder of cultural knowledge. 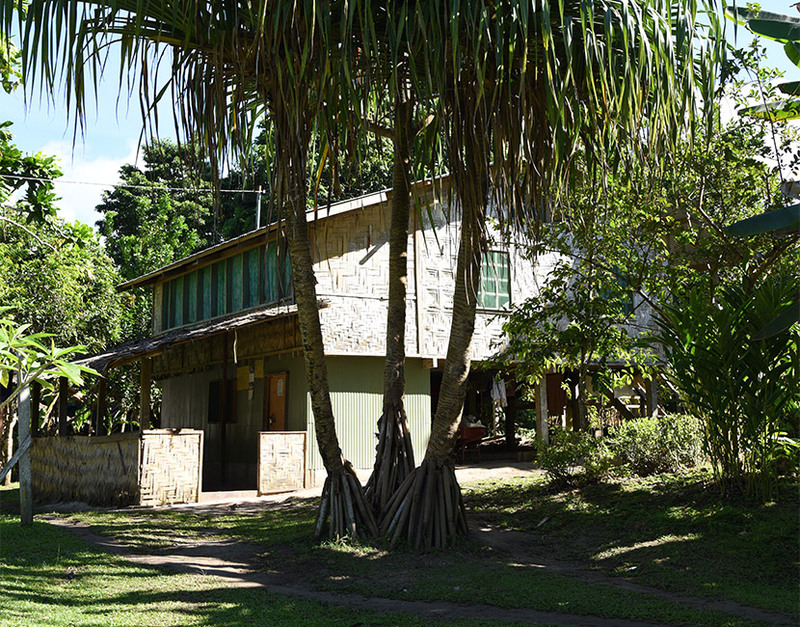 She worked for Bougainville Copper Limited (BCL), a subsidiary of Conzinc Rio Tinto, monitoring the environmental impacts of the Panguna mine in Central Bougainville before moving to Australia in the late 1980s, where she began to explore her love of Pacific material culture within a range of museum contexts. 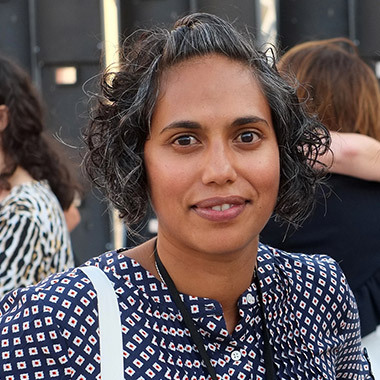 Balai retired from her curatorial role at the National Gallery of Victoria, Melbourne, in 2016, after 20 years working in the field. She is a highly respected elder within Australia’s Pacific community, an Honorary Associate of the Victorian Museum and has served on the boards of Wantok Musik Foundation, Australian Association for Pacific Studies and the Contemporary Pacific Arts Festival, among others. Marilyn Taleo Hatukul Havini was born in Sydney, trained as an artist and teacher and in the late 1960s married Moses Havini, a future chief of the Hakö-speaking people of Buka Island. The couple moved to Bougainville where Marilyn taught art at local high schools on Buka and Arawa while continuing to paint and sell work. 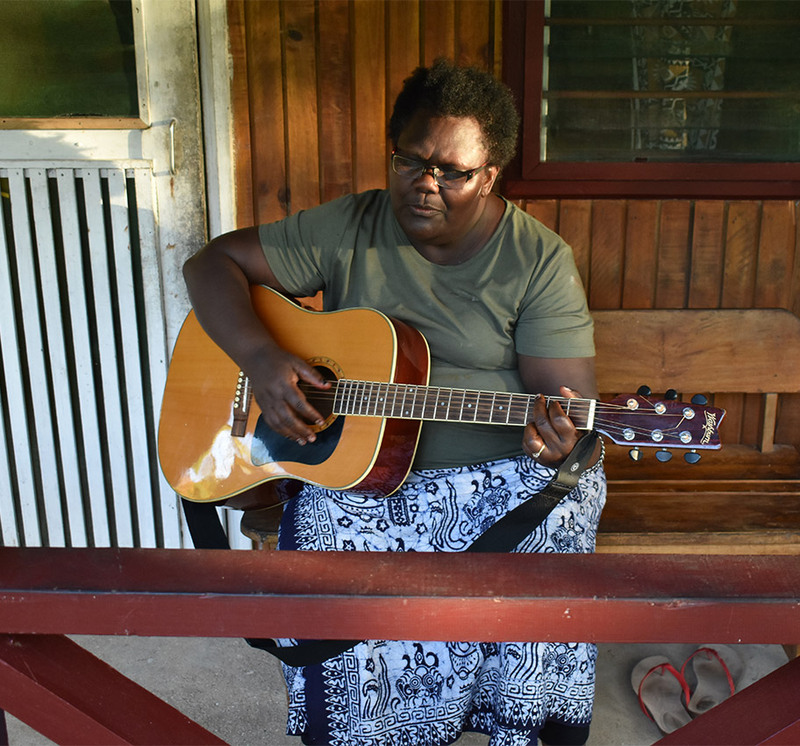 In 1989, as the political crisis erupted, the family fled Bougainville for Sydney, and there Marilyn continued to teach while supporting Moses in his efforts to bring attention to atrocities of the civil war and sanctions imposed on the islands. Over the decade of conflict, the Havinis became prominent international spokespeople for Bougainville and central players in the region’s peace process. 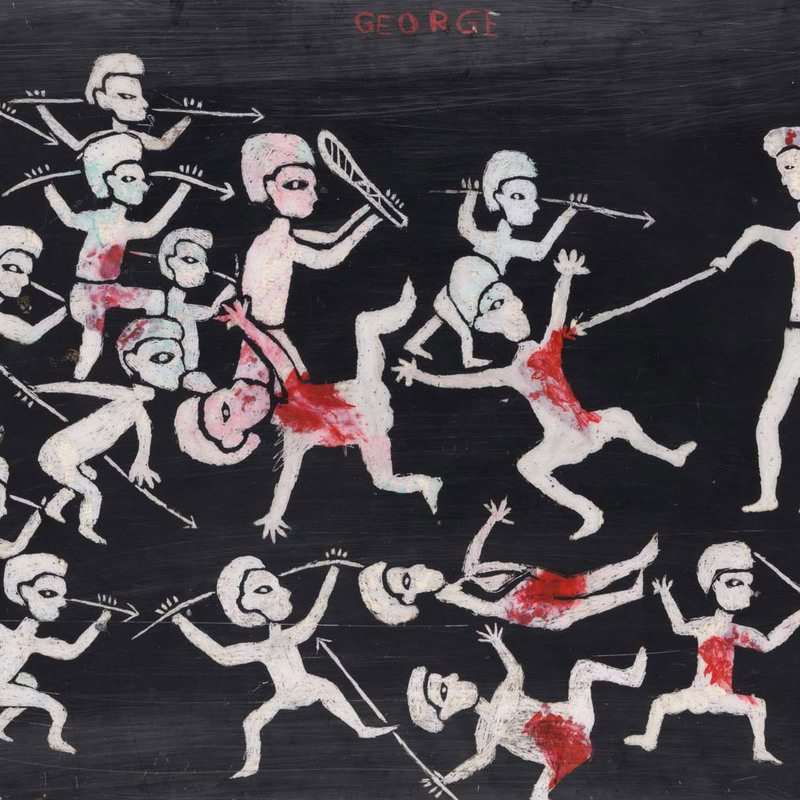 The paintings Marilyn created during this time document the impact of the conflict on everyday lives as well as major figures involved in the peace process, and were acquired by the new Autonomous Bougainville Government to be displayed prominently in the new parliament. With the signing of the peace agreement in 2001, the Havinis moved back to the village of Ngalkubul in Hakö where Marilyn continues to live and work as an Organisational Mentor through the Australian Volunteers Program for the Women’s Collective she helped to found. 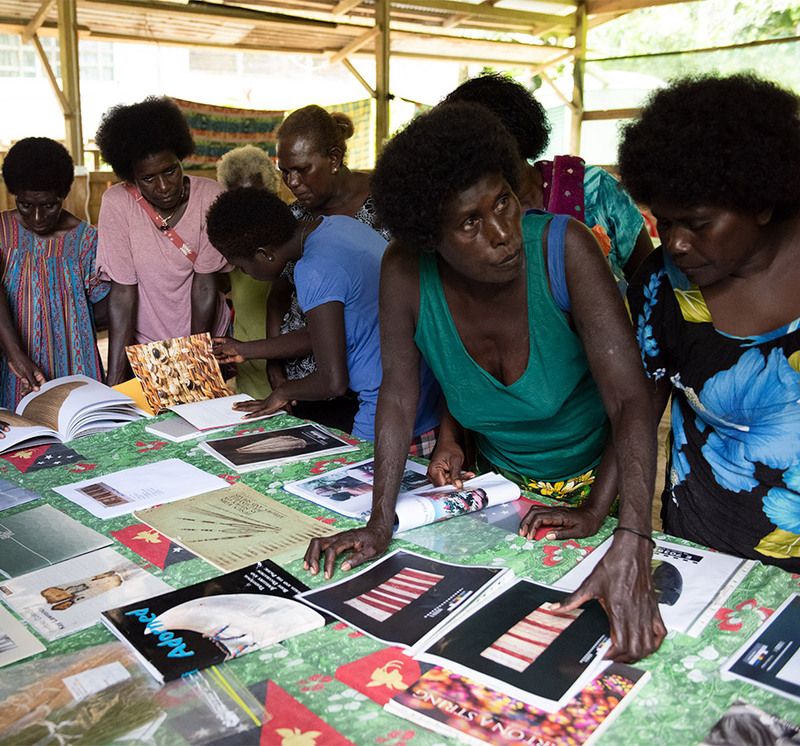 Central to the development of the Women’s Wealth project was a ten-day creative workshop held at the Nazareth Rehabilitation Centre at Chabai in North Bougainville. 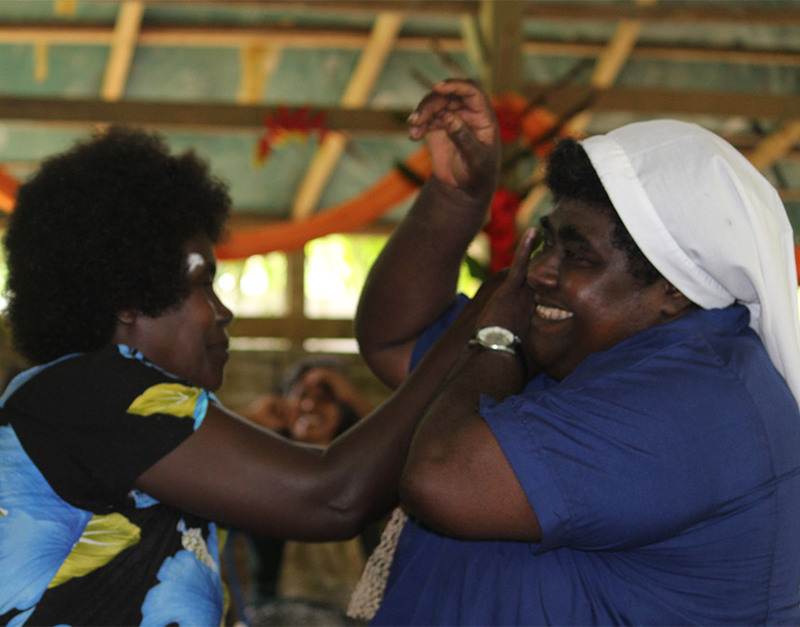 Ten women from across the island as well as four from the Solomon Islands and four from Australia participated. 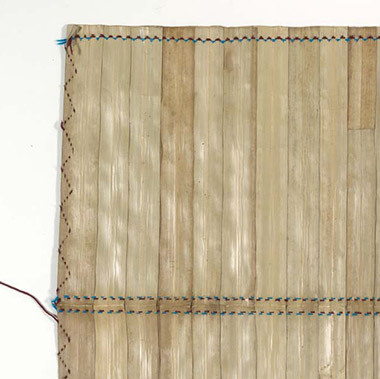 Artists were asked to bring materials to create new works and encouraged to share knowledge and techniques within the boundaries of their cultural protocols. Over the duration of the workshop, language barriers and cultural differences dissipated as the women established a rhythm of living and working together. 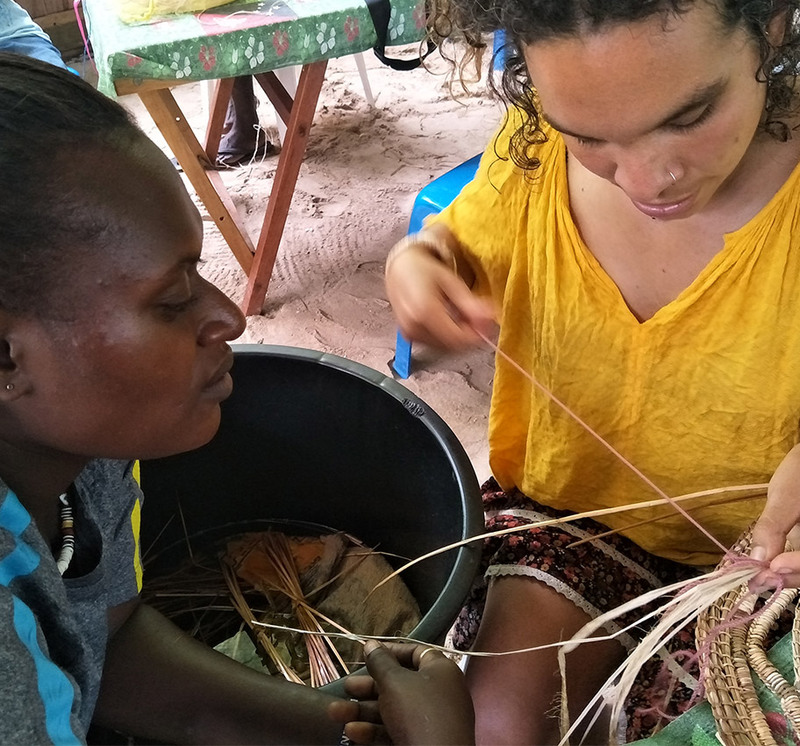 The group learnt how to dye pandanus with noni root and create pinch pots, experimented with coil weaving techniques and raffia, learnt each other’s cultural dances, pit-fired their pots and beaded friendship bracelets. The women also shared stories about their culture and personal histories, and explained the role art plays within their lives. Other conversations centred around the ways in which creative work expresses intent and agency; how indigenous material cultures articulate different social values; the importance of continued adherence to customary beliefs and protocols alongside newly acquired Christian values; ideas of copyright and ownership of customary forms; as well as shared experiences of dispossession of land and culture. All participants left with a vision for what they wanted to create for ‘The 9th Asia Pacific Triennial of Contemporary Art’ (APT9) at the Queensland Art Gallery | Gallery of Modern Art. 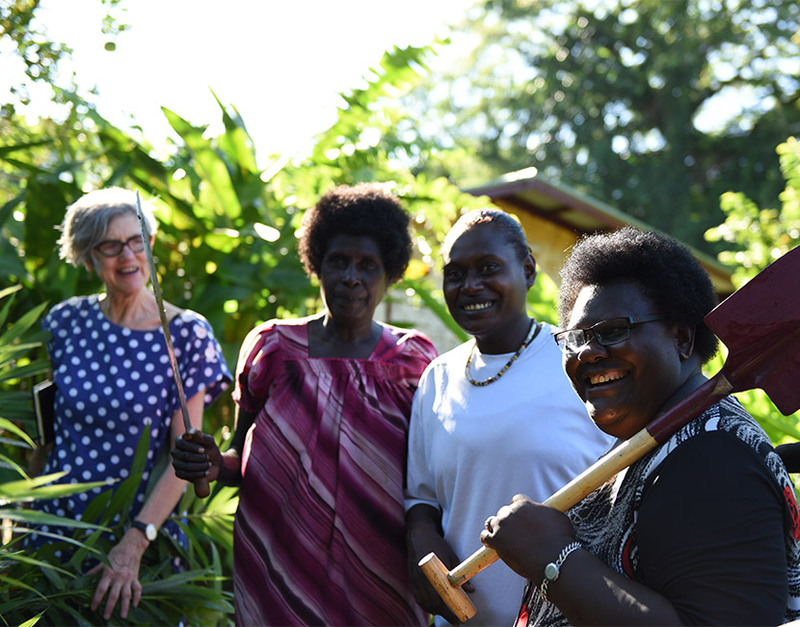 The Nazareth Rehabilitation Centre was established as an NGO in 2001 by the Bougainville congregation of the Sisters of Nazareth to provide women and children impacted by gender-based violence with safe houses, counselling and medical referrals. 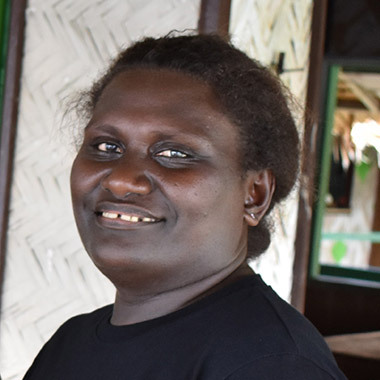 The centre runs awareness-raising and prevention programs in the Bougainville community, including with men and boys to bring about social behavioural change. 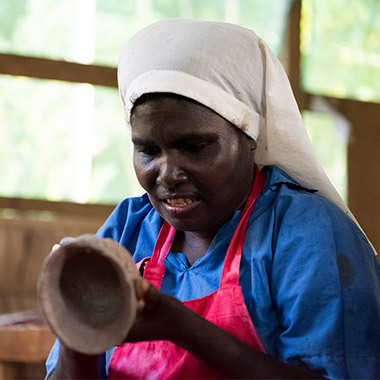 The Nazareth Rehabilitation Centre is led by Sister Lorraine Garasu, recipient of an Order of Australia and the US State Department’s International Woman of Courage Award. 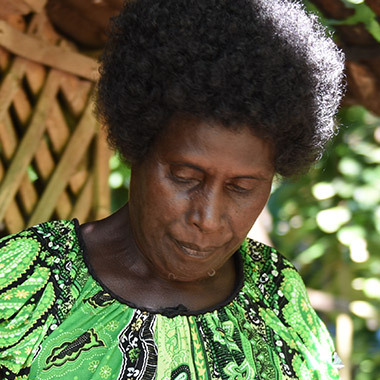 She played a key role in the Bougainville Peace Process by organising women’s groups to call for peace, and as a representative in the formal process. 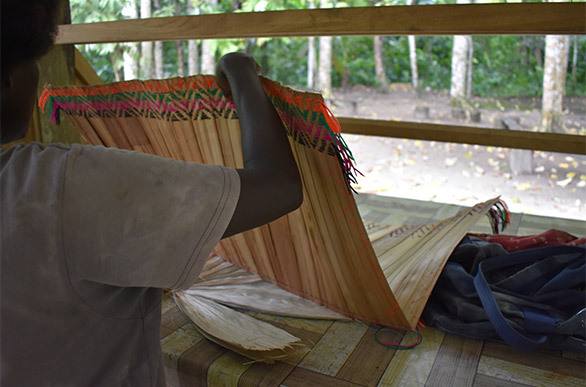 Textiles made from the leaves of local plants and dyed with extracts of their roots and seeds are often created by groups of women in the Autonomous Region of Bougainville and nearby Choiseul Province and are infused with stories. 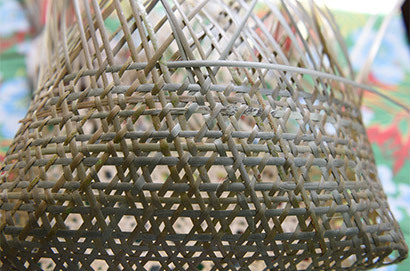 The designs marked on the surface of or woven into the textiles are inspired by patterns observed in the natural world. 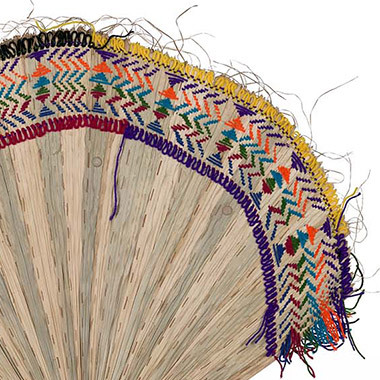 The clan stories connected with these designs are recounted by the women who strip the leaves, grate the roots and weave or stitch the textiles. 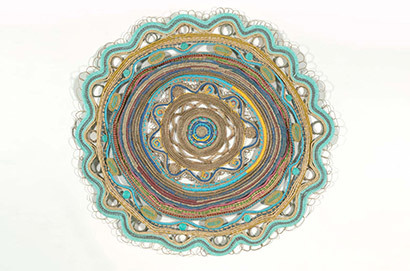 These artists also tell stories about the pathways the objects take into the lives of others, and recall textiles that were made and gifted to them personally. 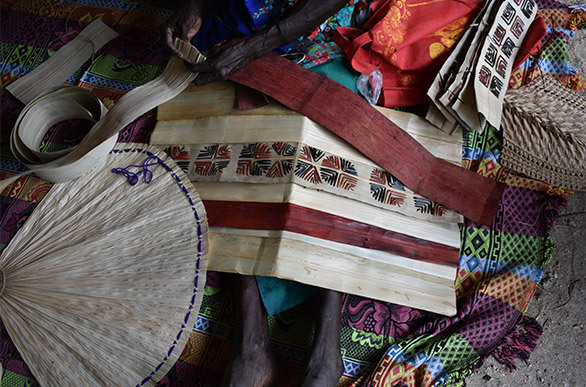 Tuhu are elegant hoods constructed by women on Buka Island and the North of Bougainville from broad pandanus leaves, and in some instances are marked with bold red and black embroidered designs designating their owner’s elevated status. These unique sculptural forms are given names corresponding to the status of their wearer, represent some of the most important visual expressions in this region and are worn as ornamentation as well as a protective covering in public ceremonies related to coming of age, matrimony, death and the investiture of clan chiefs. 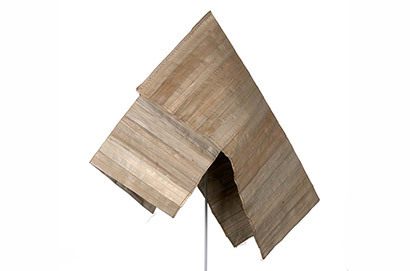 While the most ornately decorated hoods, known as A’Poa, can only be worn by the clan’s queen during Palmatana ceremonies, or used as a coffin at death, unmarked Tulbus are worn by clanswomen and fulfil multiple functions within and outside of ceremony — as mats, food covers and as shelter from the rain and sun. 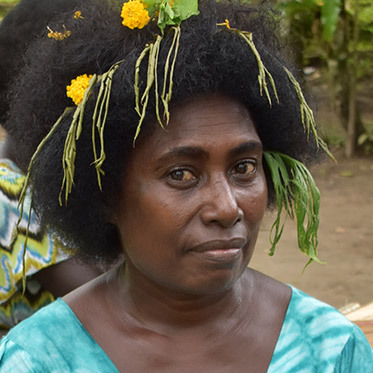 The majority of works created for Women’s Wealth were made by groups of women from the Nakas and Nakaripa clans of Buka Island. 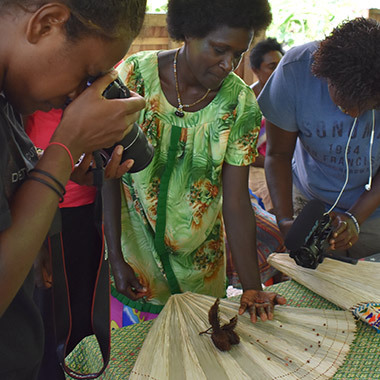 Led by Kiria Asike, these women spent weeks sourcing and preparing materials before meeting at Marilyn Havini’s home, where they stitched designs onto strips of pandanus, then sewed these into capes. During this time, other family members stepped in to tend to gardens and feed family. 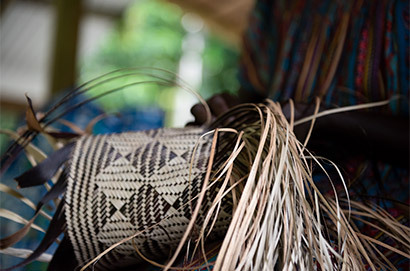 The patterns used to decorate the Tuhu capes (or Sinsu) worn by clan chiefs differ according to which of the four Buka and North Bougainville clans the chief belongs: Nakaripa, Naboin, Nakas or Natasi. 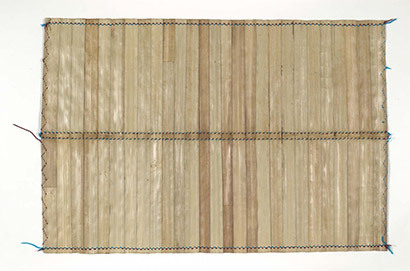 For example, capes known as Kakoto feature small rectangles of colour woven into a number of the strips of white pandanus used to construct the cape. 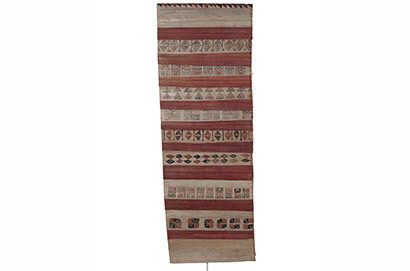 Alternatively, chiefs from the Naboin and Nakas clans wear capes decorated with red squares, while those marked with red and black are reserved for chiefs of the Nakaripa clan. Geometric designs in red and black embroidered onto the Sinsu likewise identify the clan to which the wearer belongs. The most ornately decorated capes, known as A’Poa and worn by the three highest ranking chiefs, are decorated with the designs from all four clans. 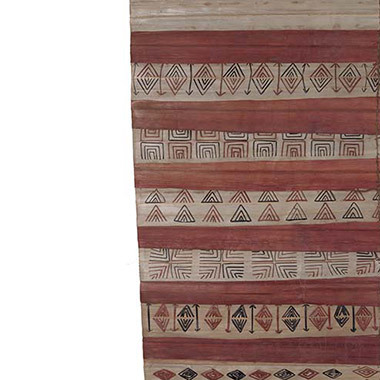 Triangular designs in red and black found along the top of a chief’s cape (from Tulbus to A’Poa) are known as Kaliana. 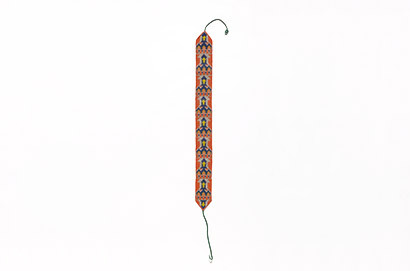 Decorated Sinsu without the Kaliana can be worn by A Hatutu (second in line). 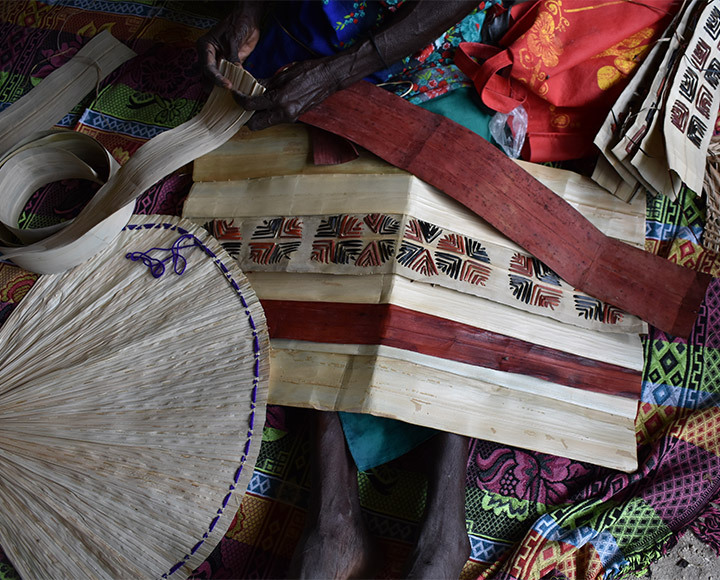 Delicate biruko fans are carried by women and used in choreographed ceremonial dances in Central Bougainville. Geometric designs embroidered in natural fibre, and more recently in bright wool, along the biruko’s upper lip enhance its visual impact as it moves through the air. 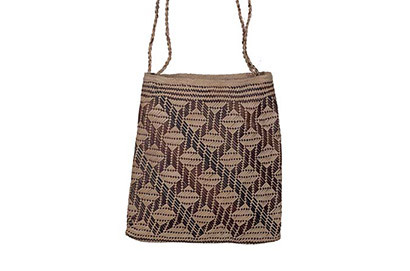 Constructed from the leaves of the black palm, these fine textiles are a symbol of womanhood and can be carried only after a young woman has completed the seclusion that accompanies her first menstruation. 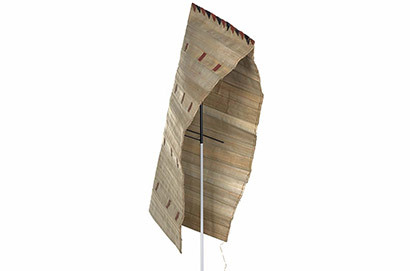 Then the biruko is carried and used extensively as not only a fan but also a knapsack, sleeping mat, lap-lap, container or serving dish for food, baby carrier and shelter from the rain and sun. 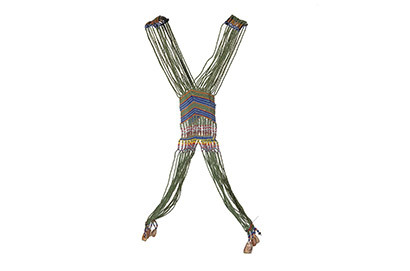 Today, perhaps the most popular use of the biruko is as part of singsing (dance ceremonies), where their unique fan shape and bright patterning enhance the women dancers’ sinuous movements. These dances are performed at festivals and cultural days as expressions of identity and cultural connection. 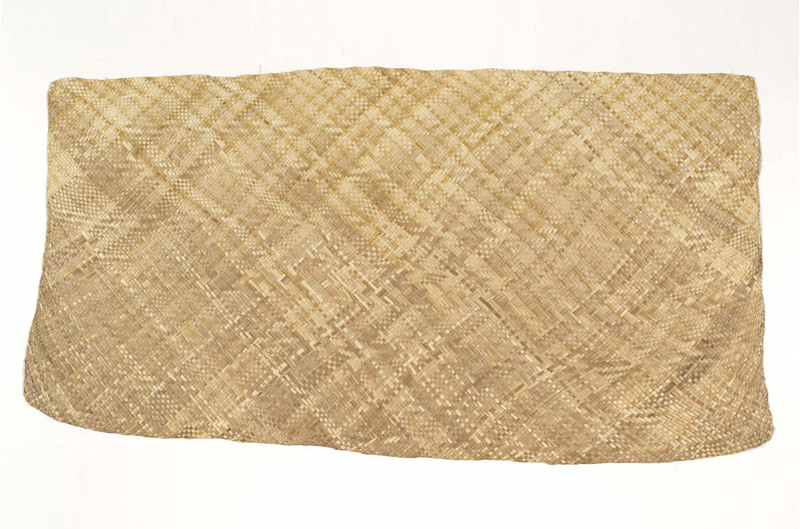 Like many of the textiles created by women for the Women’s Wealth project, stitched and woven pandanus mats are kept close to the body, used for sitting on, as shelters and for presenting or covering food. 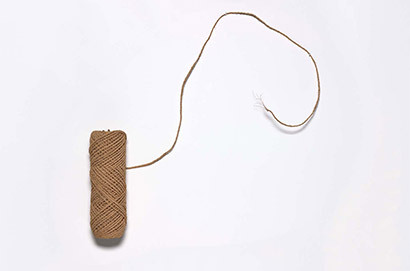 These objects are frequently exchanged between kin and clan members as an expression of love and attachment. 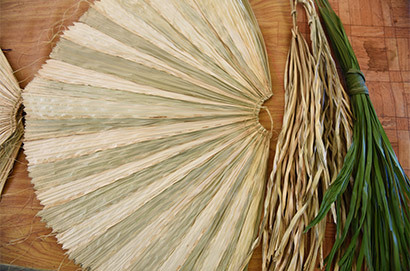 While firmly located in the domestic realm of women’s lives, pandanus mats can also be transformed into ritual valuables used in inter-clan exchanges and ceremonial occasions marking rites of passage, such as coming of age and marriage. 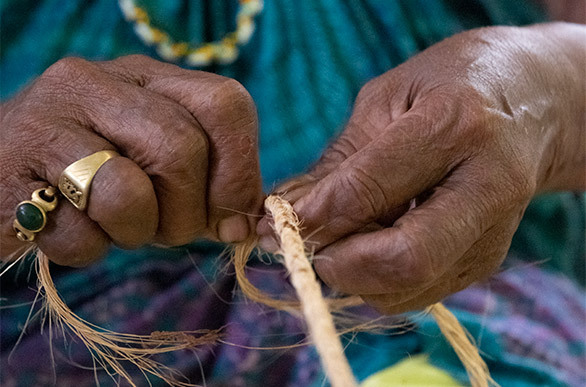 Women work in groups to create large quantities of textiles, and combine them with handwoven baskets filled with food from their gardens and store-bought goods to create a generous gift. 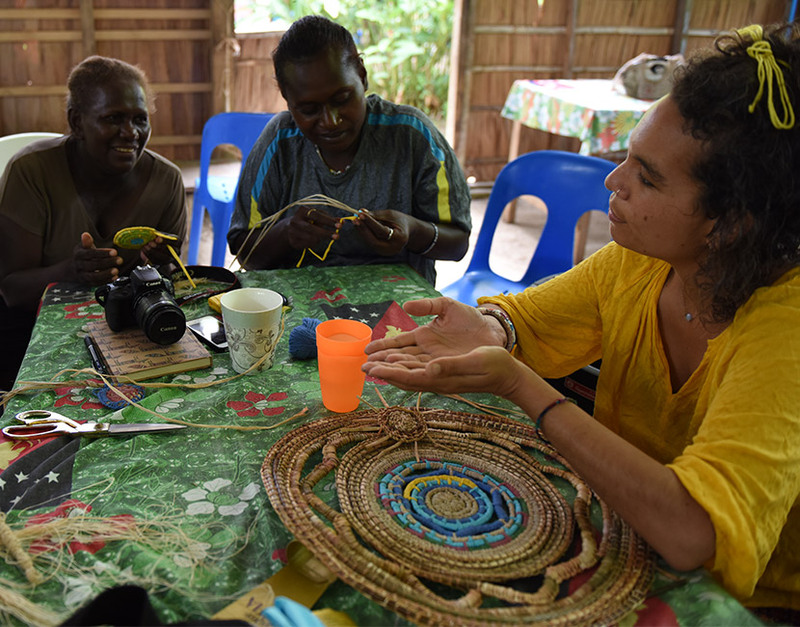 Elisa Jane Carmichael’s A place to share 2018 responds to the gathering of women in a weaving circle at the Women’s Wealth workshop in Bougainville in September 2017. 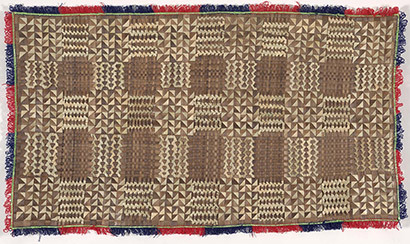 Using a coil-bundle weaving technique traditional to Indigenous women in south-eastern Australia, Carmichael created a mat in a form used throughout the region to designate a space for coming together. A place to share is circular in shape and incorporates yunggaire, a reed of subtly changing pink and green hue that grows in swampy areas of her island homeland Minjerribah (North Stradbroke Island). 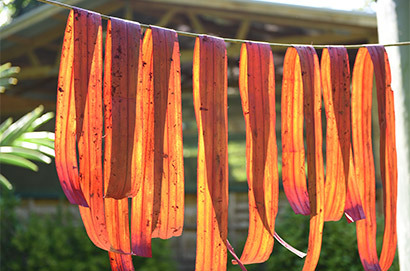 In addition to this special reed which Carmichael carried to Bougainville from her own country, in this work she has used a deep red pandanus leaf, dyed by Hakö artist Kiria Asike at the workshop, and a range of discarded sea ropes and fish scales gathered with family members from the beaches of Minjerribah. A place to share asserts strong ties to country and traditions. 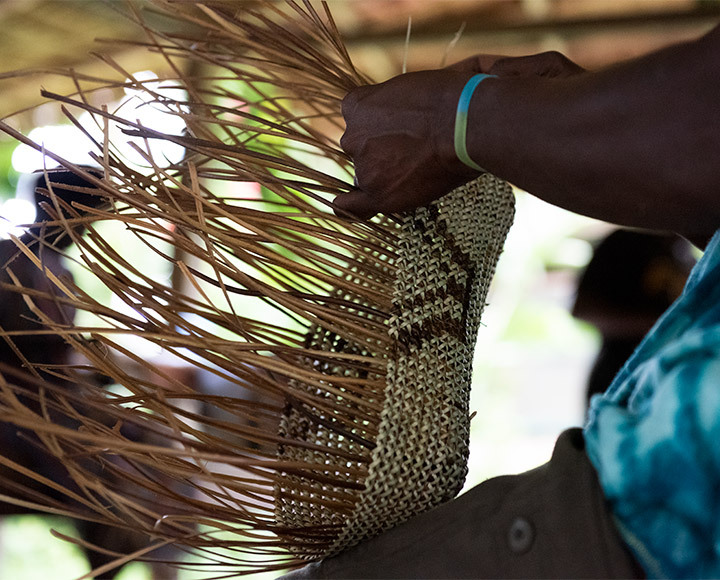 Baskets created through the Autonomous Region of Bougainville are not only containers for carrying or storing everyday goods, but also repositories of time, labour, knowledge and relationships. 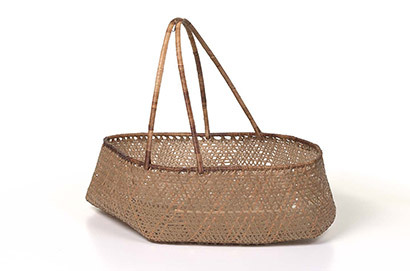 Baskets link people to specific geographies, family members, histories and cultures. Created from fibres and vines gathered in local forests and gardens, these forms communicate information about a particular environment and ways of living in harmony with it. 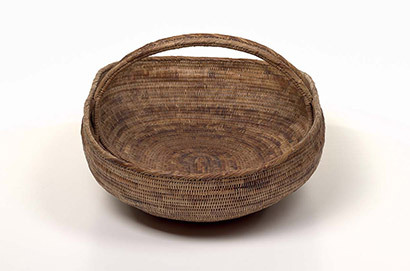 A basket retains the shape of its raw materials and the traces of bodily movements involved in its construction, and is created using techniques and knowledge passed from one generation to the next. 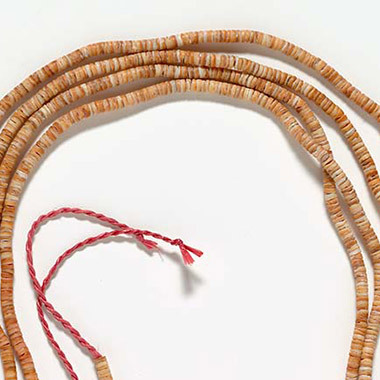 These objects are treasured heirlooms and often play a fundamental role in the expression of cultural identity or as carriers of sacred meanings. 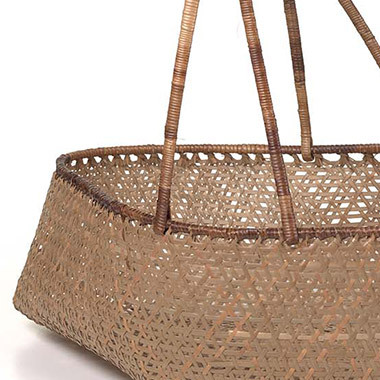 Traditionally only created by men in South Bougainville, Kokan — elegant baskets woven from cane using a stitched coiling technique — are used to carry and store important or personal belongings, food and even infants. 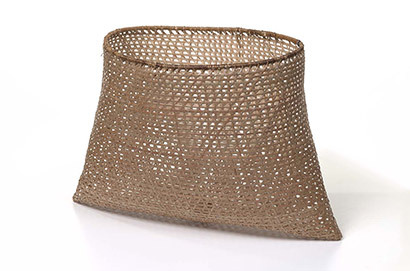 Commonly known as ‘Buka baskets’, these objects are at times decorated with geometric patterns worked in a lighter colour achieved by using the underside of the split cane. 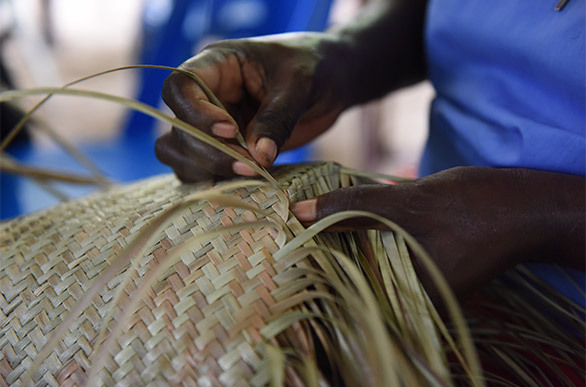 In more recent years, the weaving of baskets in South Bougainville has declined significantly with the introduction of plastic and other storage containers and the influx of woven cane baskets made by Highlanders into craft markets. There are, however, a number of individuals who continue to make baskets to express their cultural identity or generate income. 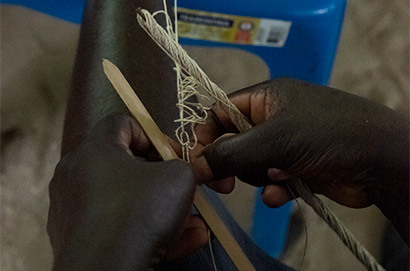 The technique for weaving Kokan in Women’s Wealth has survived through practitioners such as Jacob Mikai and Peter Pemou, who are training young women and men to keep this unique art form alive. 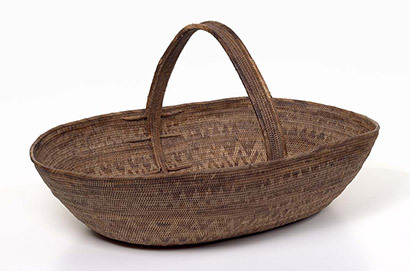 Tohene, or chief food baskets, are large coconut-leaf baskets used for carrying and storing food in the Nukumanu Islands. These seemingly humble objects provide a material link to the natural environment and to the coconut trees lining the island’s shores. Every part of the coconut tree is used to sustain and aid life on this remote atoll populated as part of Polynesian wayfarers’ western migrations. 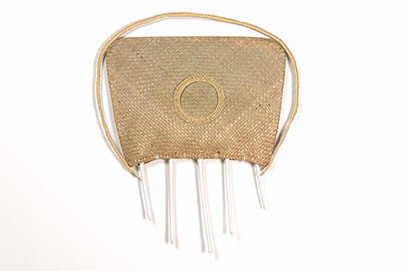 Nukumanu Island artists such as Aida Pais continue to honour the creative actions of their Polynesian ancestors by gathering materials associated with place and making works expressive of this heritage. 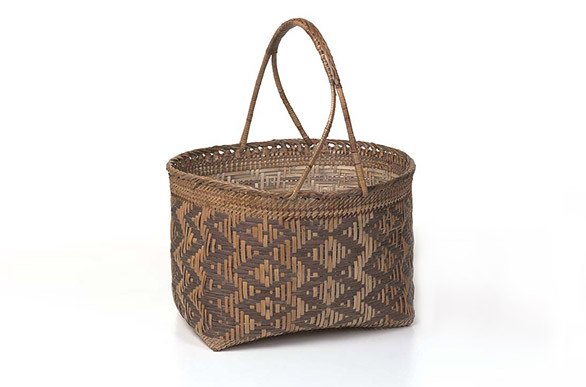 The importance of pattern is evident in the contemporary basket-making practice of Emma Hopuhopu Makusu, in which age-old techniques are creatively reimagined. 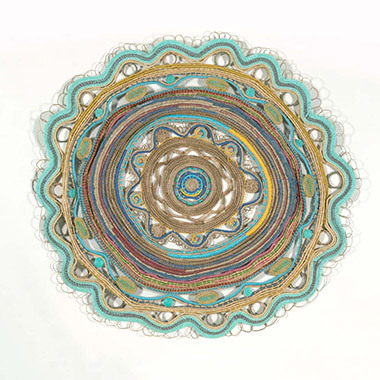 In her works, geometric patterns interwoven with texts and brightly dyed fibres ripple and shimmer before your eyes, creating optical illusions. 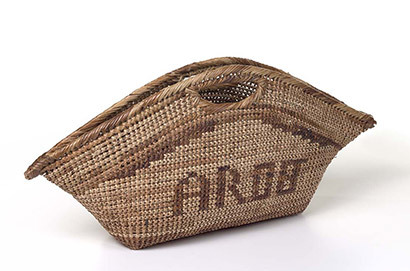 The rectangular handbag-shaped form of Makusu’s baskets is inspired by bags traded with Solomon Islanders travelling to Bougainville to trade or connect with family members. 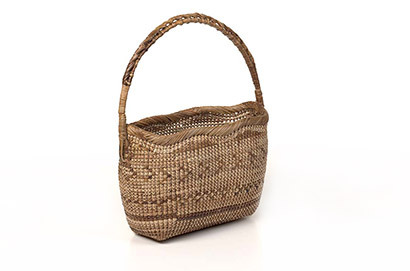 The inherent strength of the natural cane and rattan fibres used by Banoni artists Sister Theresita Alona, Milceller Gabu, Prisca Suana and Maria Wotsugogha enables them to create durable basketry forms perfectly suited to everyday tasks, from collecting garden produce and laundry to carrying personal belongings. 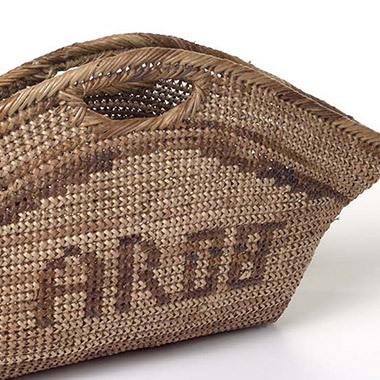 Perfected over centuries, these forms include ingenious decorations, such as the elegant open diamond–shaped weave of the Pai that allows dirt from freshly dug root vegetables or water — in the case of the Sister Alona’s Reragowowana (fishing basket) — to pass through the basket. 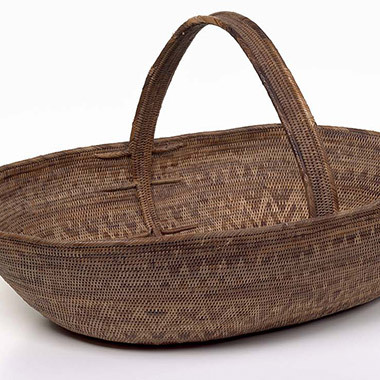 More complex woven patterns in the Katebo baskets women use as personal carryalls incorporate a combination of green Pai and black cane known as miyo. 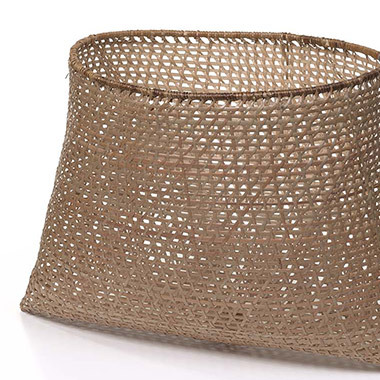 Continuing to build on traditional forms, these baskets are now also fashioned with long handles and in shapes and sizes that enable them to be used handbags. 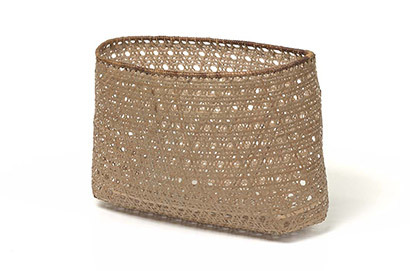 The elegantly constructed, crescent-shaped baskets found in local markets are a contemporary Bougainville innovation. 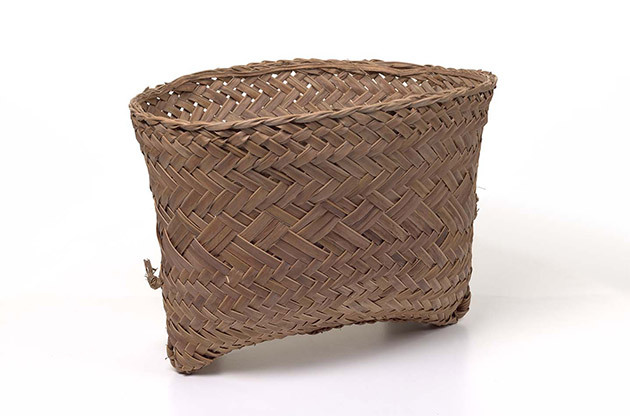 Inspired by the unique bicornal shape of coconut-leaf baskets used by Gunantuna men in nearby East New Britain, these Bougainville adaptations are created from lengths of cane found in local forests and woven using traditional basketry techniques. Master of these techniques Elizabeth Marata experiments not only with form but also with the beautiful dual colours of the cane she uses, twisting its darker outside skin to create surface designs ranging from the acronymn AROB to the iconic Upe headdress worn by men in areas of Bougainville as part of their initiation practice. 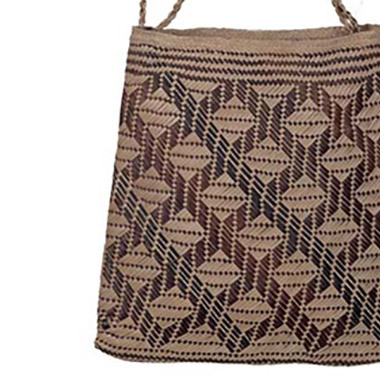 Weavers of Choiseul Province in the northern islands of the Solomon Islands archipelago continue to make elegant string bags distinctively patterned with diamonds, and with handles just long enough to fit over the shoulder. 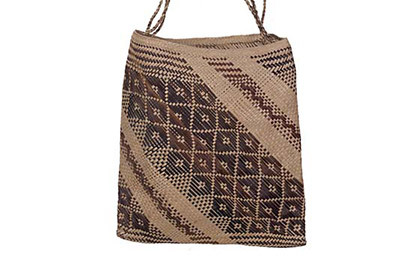 Known locally as kuza, these all-purpose bags are made in beautiful pale, undyed natural fibres and are a symbol of Choiseul womanhood. 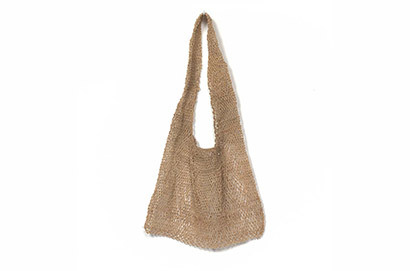 Sometimes the warm tonal shifts of the natural fibres used in these bags are mimicked with brightly coloured nylon threads. Women working with nylon also experiment with pattern, moving the string bag into the realm of fashion and the contemporary marketplace. 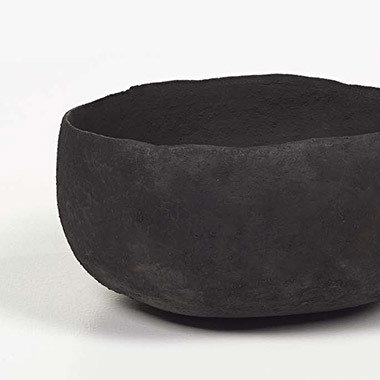 Spherical hand-built pots were once created in many parts of the Solomon Islands and nearby Bougainville for storing and cooking food. Created from local clays, and at times mixed with sand and glazed with the juice of local fruit, these pots served many purposes, from storing family valuables, such as traditional shell money, to functioning as ceremonial gifts. 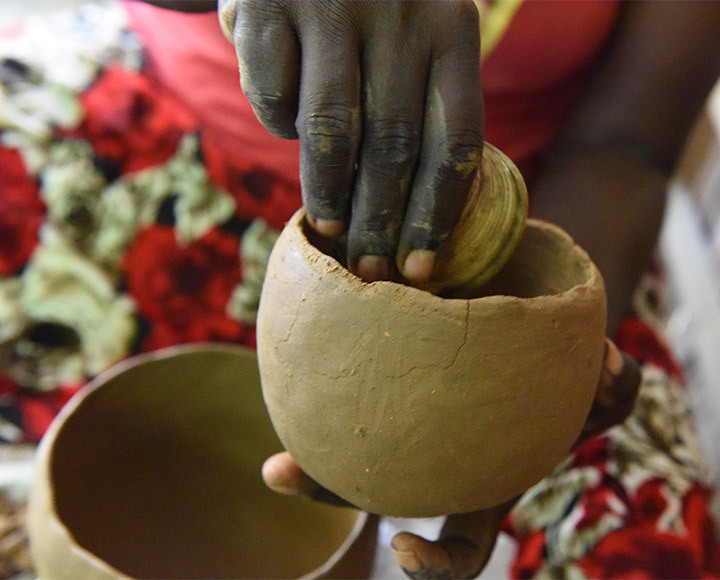 Today, with the introduction of imported metal cooking utensils and plastic storage containers, the women of Sirovange on Choiseul Island are some of the only the potters in the region still using local clays to create customary earthenware vessels. 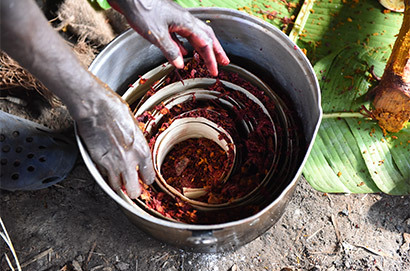 Blackened with the sap of local fruit prior to be fired in a pit, Sirovange pots such as those created by Imelda Teqae are created in a variety of shapes and sizes suited to the tasks of cooking and storing food. 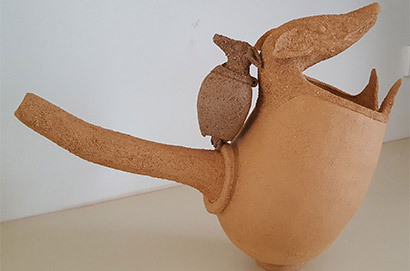 Teqae has also begun to develop forms, such as the goblet and jug, which can be sold as gifts and expand these pots’ role within her community. 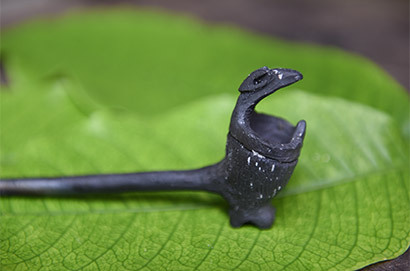 Pipes fashioned from clay and other plant materials were created and used extensively throughout Bougainville. 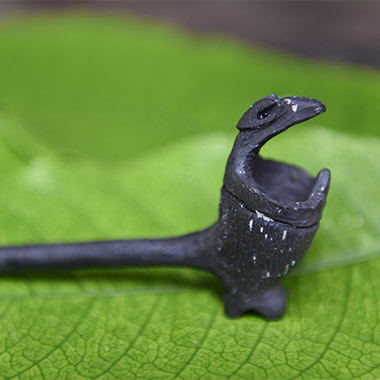 Like the small, intricately decorated lime pots that held lime, consumed with buai (betel nut) and dakah (mustard), these pipes were both functional items and personal adornments or keepsakes. With their quite short pipe and large bowl, they fitted very comfortably in the hand — one can imagine makers holding the unfired work, testing the length and weight until the perfect balance was achieved. Intrigued by these items of her culture discovered in museum collections around the globe, Women’s Wealth artist Taloi Havini instigated the creation of a series of these pipes at the workshop. One very special example was modelled with the figure of a dog, signifying Havini’s Nakas clan. Local spectators were able to handle the forms before they were fired, and unfortunately a large number of them were broken as a result. Confluence 10 2017, made by Janet Fieldhouse, is in part a portrait of Taloi Havini and her late father Moses. 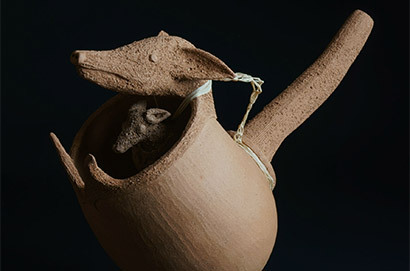 The work comprises two pipes with the head of the Nakas dog modelled on the lip of the bowls. The smaller Nakas is carried by the larger, in a moving tribute to the strength of the Havinis’ father–daughter relationship and the importance of kinship in this region. 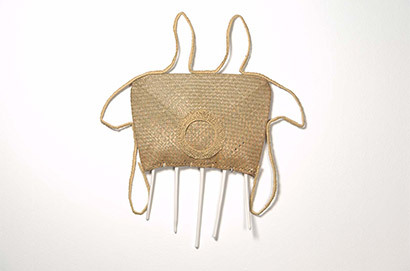 Janet Fieldhouse has created a pair of larger-than-life hair combs from elegant woven baskets and ceramic rings that reference not only the importance of this form of body adornment in Bougainville and the Solomon Islands but also her ancestral lands in the Torres Strait. Hair combs embellished with woven decorations or carved with intricate patterns were created and used extensively throughout the Pacific. The adornments, fashioned with highly valued materials, were status symbols worn more often by men than women. 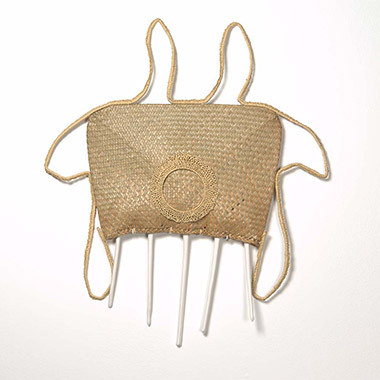 Fieldhouse constructs the body of her combs from baskets as a type of cut-out, focusing attention on the mount that connects them to the wall comprising rings hand-moulded from a variety of clays. Reminiscent of shell adornments, the delicacy, hue, tactility and durability of these rings emphasise the sophisticated ways in which islanders work with available materials to great aesthetic and symbolic affect. 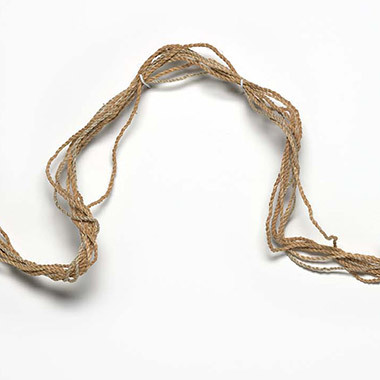 String and its heftier cousin, rope, are central to life on most islands throughout the North Solomon Islands region. 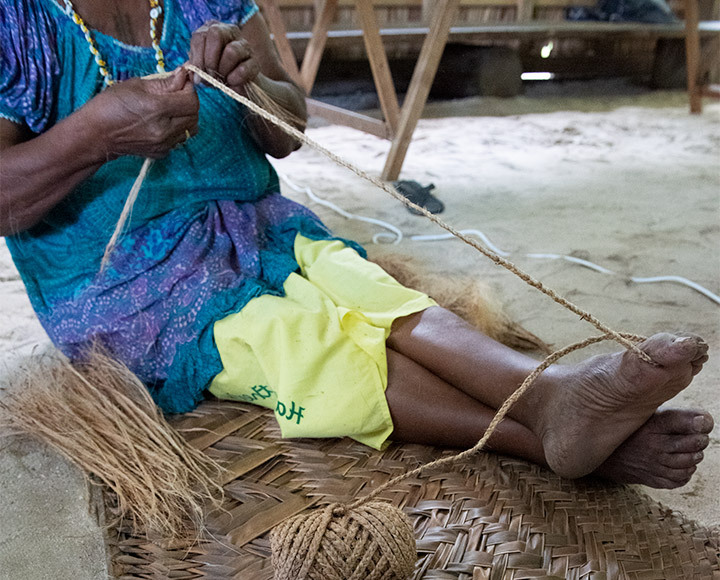 Using a seamless backward plying motion, women roll bark fibres on their thighs into string with which they make beautiful knotted and looped bags. Bark fibres are also plaited or plied together into tough usia (ropes) used as lashing for building homes and boats, for fishing, in the garden or to carry heavy bundles of wood needed for cooking fires. 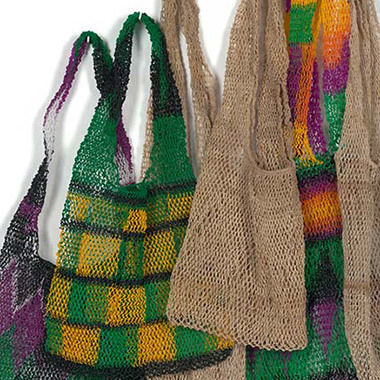 In Choiseul, women create these usia as an essential part of their dowry to take to their marital home alongside their traditional kuza (string bag). 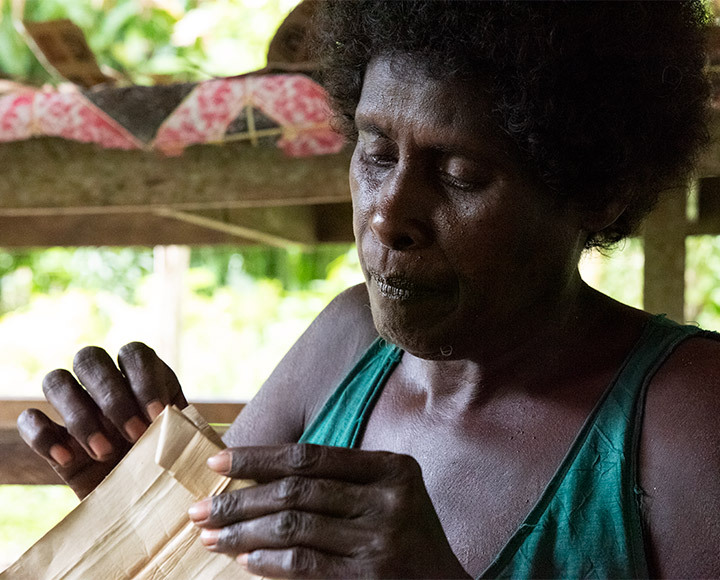 The Autonomous Region of Bougainville and nearby societies in the Solomon Islands have many indigenous forms of currency, including shells, dog and porpoise teeth, stone and more recently commercial beads. These often visually impressive currencies are used for mortuary and bride exchanges, compensation payments and sometimes commodity exchanges. Unlike European currencies, whose value is fixed by government, this wealth circulates and attains value through relational ties. Each island, and sometimes individual language groups on the same island, has its own valuables. Shell money in the Hakö-speaking region of Buka Island, for example, is named Beroana, while in Siwai in the south it is known as Mimis. 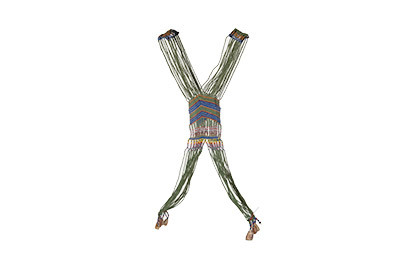 In the Nukumanu Islands, patterned belts beaded with shells, and more recently brightly coloured commercial beads, are created to be worn in marriage ceremonies and when a woman is first pregnant. During the latter stages of pregnancy, the belt continues to be worn as a support to keep the baby in position and to stop the mother’s body getting out of shape. 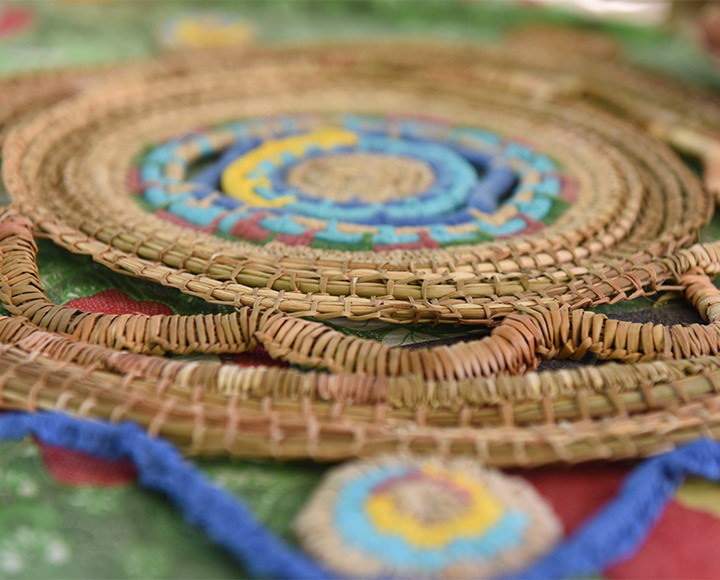 Siwai women in South Bougainville create and wear a range of adornments created from shell valuables or brightly coloured beads, the most ornate being a chest harness known as Hanai aakono (‘wear back and front’). 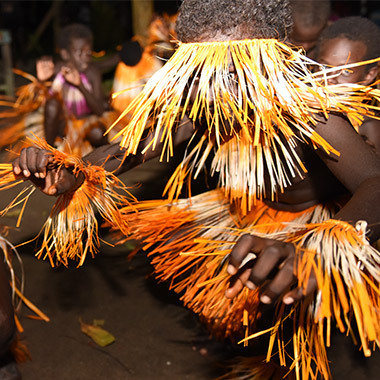 Music and dance are some of the most vibrant and visible forms of expression in Bougainville and the Solomon Islands. 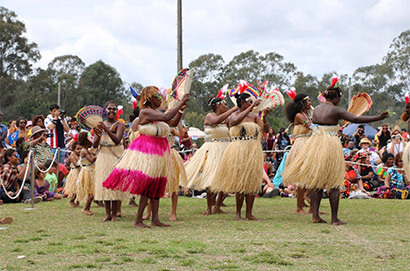 Traditional and new songs and dances are performed by community groups throughout the region to mark important ceremonial occasions and celebrate local culture during festivals and on special days, such as AROB Day. 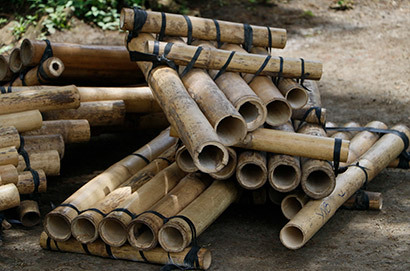 Some of the most iconic sounds are produced by bamboo ensembles. 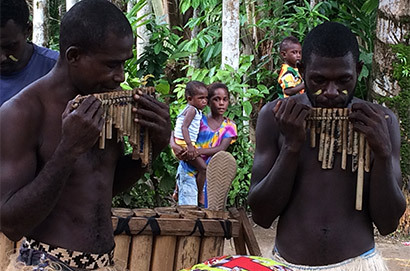 Across Bougainville, groups of men come together to strike the ends of a stack of bamboo pipes with rubber flip-flops, creating rhythmic, resonant sounds often accompanied by higher notes played on bamboo panpipes, the deeper bass sounds of slit-gong drums, and women’s melodic singing. While in the past, coconut husks were traditionally used to beat the bamboo, today flip-flops are used either with bamboo or PVC pipes. 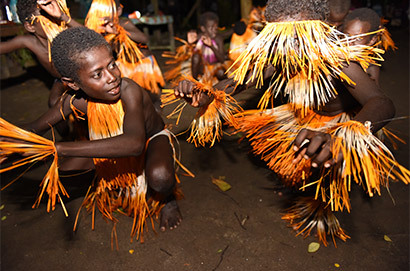 Traditional dances and songs are as diverse as the mix of more than 20 different language groups found across the Autonomous Region of Bougainville. In performance, men and women wear special ornamentation as a specific marker of both cultural and gender identity. Dances are customarily performed against live drumming to mark important rites of passage, including initiation, coming of age, marriage and death. 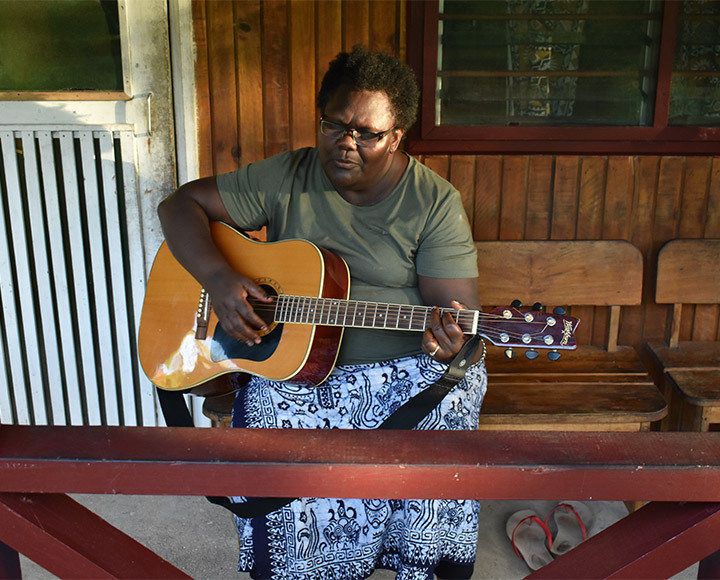 Music in general imbues life throughout the region — guitars are found in every household, and local forms of lotu (church), reggae, string band and heavy metal music have all flourished. ‘Habitat’ is a series of video installations launched by Taloi Havini in 2016 to address the representation of landscape and conflicting interests in Bougainville. 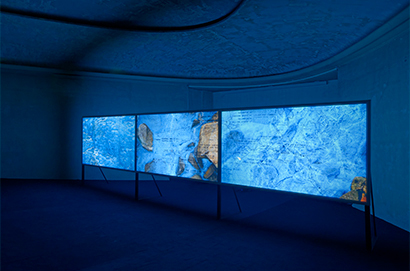 The earliest iterations of this series, Habitat: Konawiru 2016 and Habitat 2017, used large projections, dramatic image sequencing and immersive surround sound to evoke the sense of loss and displacement experienced by Bougainville landowners as a result of the mining operations undertaken by Bougainville Copper Limited (BCL) at Panguna mine in Central Bougainville from 1972 to 1989. 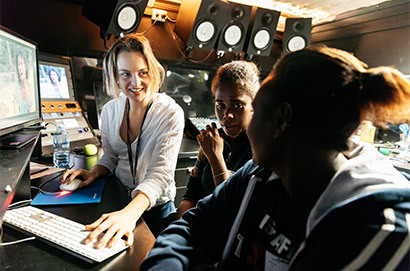 ‘The work will investigate and interrogate the colonial relationship between Australia and Bougainville from a matrilineal point of view, providing international audiences with context and understanding of the vibrancy of indigenous women’s cultural practice and connection to the land in these locales’. Kay Lawrence’s elegant woven tapestry responds to Central Bougainville artist Adelaide Mekea Aniona’s comment at the Women’s Wealth workshop: ‘Here we are not wives, we are not mothers or grandmothers, we are just women doing what we love to do. 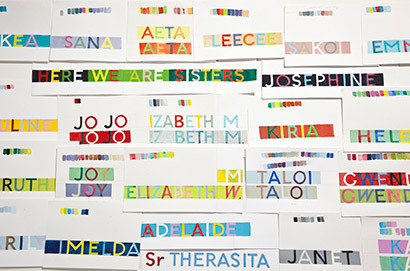 Here we are sisters.’ Woven as three long strips, the work draws on Lawrence’s own European cultural heritage, in which intricate tapestries record important collective histories and mythologies. Here we are sisters references this role of textiles as historical ‘texts’ by featuring the names of artists who participated in the workshop. Yarns chosen carefully to match the colours of clothes and fabrics worn by the participants have been woven into the names to capture a sense of women’s personalities. 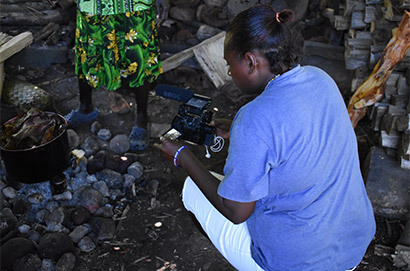 In this documentary filmed by Jesmaine Sakoi Gano (Bougainville) and Georgianna Maetale Lepping (Solomon Islands) on location in Chabai during the Women’s Wealth in 2017, a number of participating artists provide interpretations of their work. 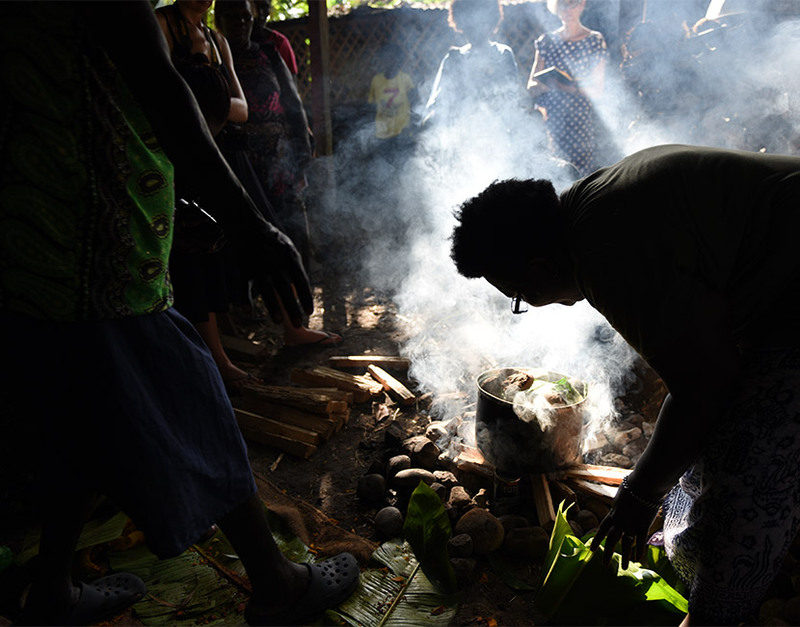 The footage includes group demonstrations of how to hand-build pots, video of a pit firing and the process of dyeing pandanus with noni root. The film was edited in Brisbane by Gano and Lepping as part of a week-long internship undertaken with QAGOMA’s Australian Cinémathèque team. 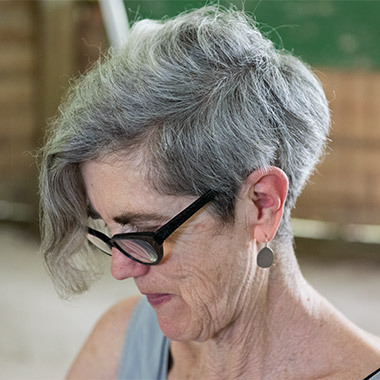 During this week the artists reconnected with Quandamooka artist Elisa Jane Carmichael by visiting and engaging with her country and family on Minjerribah (North Stradbroke Island), just off the coast of Brisbane. A lyrical composition documents the death and passage to the afterlife of a personage known in Gagan as Guérian. While there is some disagreement today about whether Guérian is a mythical or actual ancestor figure, the work is accepted as an accurate description of the possessions an eminent man from this locale would have taken with him to Sine. 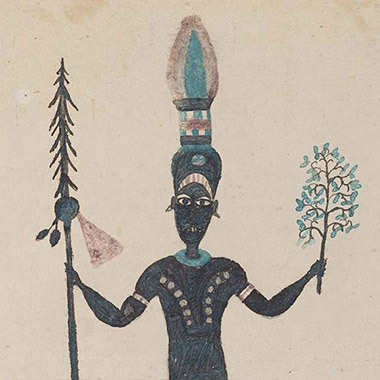 Guérian’s status is revealed via the adornments he wears, including the Upe (headdress), kapkap (shell breast ornament) and three strings of shell money. 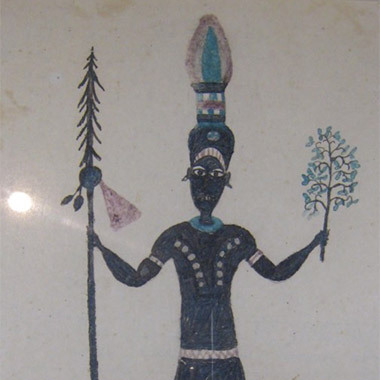 His status is further articulated through the possession of Kepa (clay pots), spears, a mortar and pestle and quantities of animals and garden plants. In his preface to the book he published of Herman Somuk’s drawings in 1951, Father Patrick O’Reilly noted that Somuk was faithful to the rich traditions and ceremonial practices his father Parebuin taught to him, despite Somuk’s ‘passage through the schools of the mission and a baptism that had made him a Christian’. 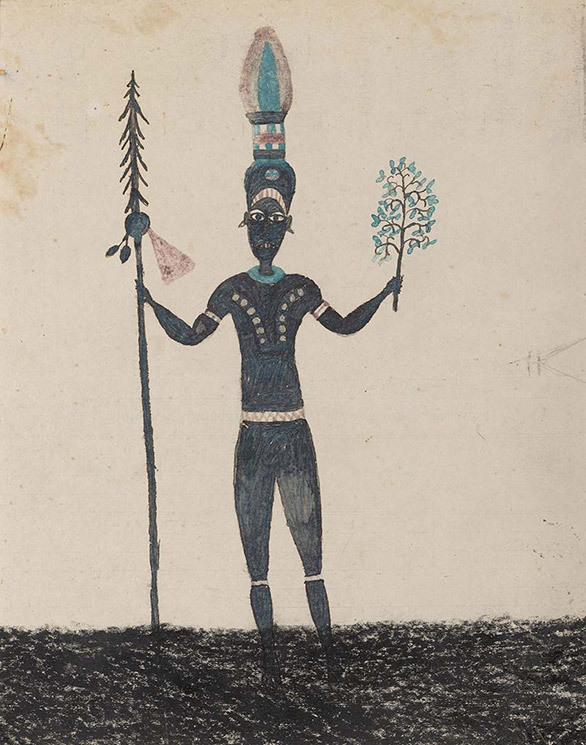 In this image, Somuk documents a young man wearing the headdress known as an Upe, once used in many areas of North and Central Bougainville as part of special rituals associated with initiation into manhood. 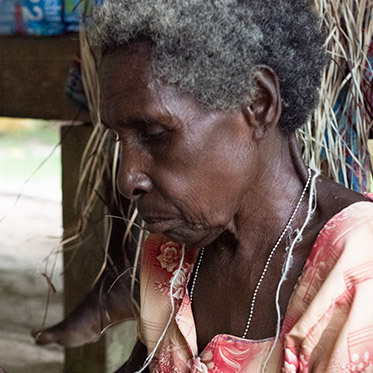 The strong influence of the Church led to a rapid decline in this practice in North Bougainville, however, and the Upe is now primarily worn and practised only in the Wakunai area of Central Bougainville. 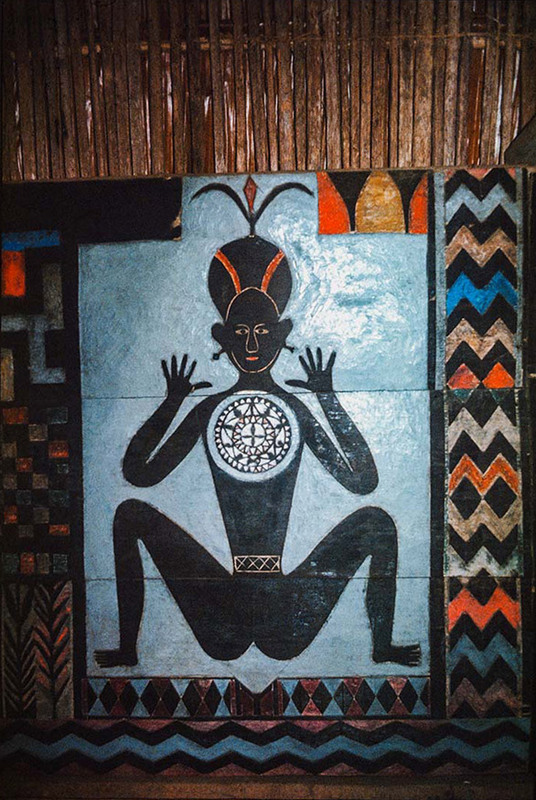 Somuk’s art could be interpreted as an attempt to preserve the Solos peoples’ ceremonies that were being interrupted and overtaken. 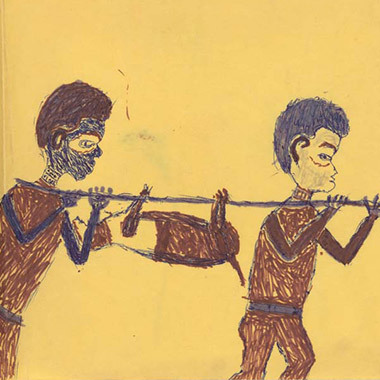 This drawing features Indigenous workers dressed in the red lap-lap worn during the colonial period and carrying picks and shovels. 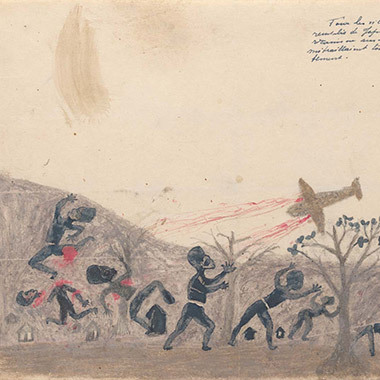 Artist Herman Somuk was strongly attached to his birthplace and critical of the creation, from the early 1900s onwards, of an itinerant Indigenous labour force for German and later Australian plantations in the Shortland Islands and Bougainville. While this drawing could reference these plantations, its date during World War Two and the inclusion of individuals wearing Asian hats strongly suggests it documents the period of Japanese occupation of Buka and Bougainville (1942–43). During this time, the Japanese constructed a number of airfields using local labour, and in Somuk’s drawing the structure with an individual at its top waving flags may be an air traffic control tower. The work is one of the only historical depictions by a local artist of this locale. In Shooting allies, Somuk captures the loss of human life on Buka Island during World War Two. 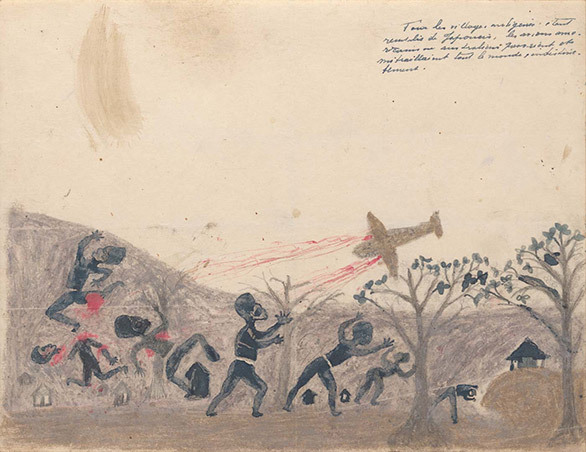 The Allied aerial bombardment of Japanese forces occupying Buka Island and Bougainville had a devastating impact on local populations, and in this work we see a low-flying plane razing the landscape of people with a spray of bullets. 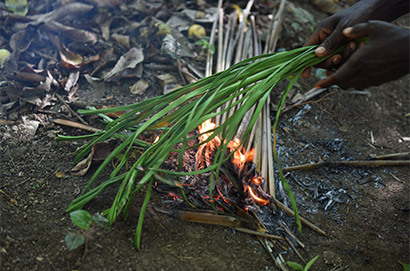 In addition to the direct loss of life via aerial artillery, dwellings and gardens were also destroyed, and because it was too risky to make gardens using traditional clearing methods — utilising fire that would attract American bombers — there was no steady supply of food on Buka. As a result of camping in damp conditions in local caves and forests, hundreds also died from preventable diseases. 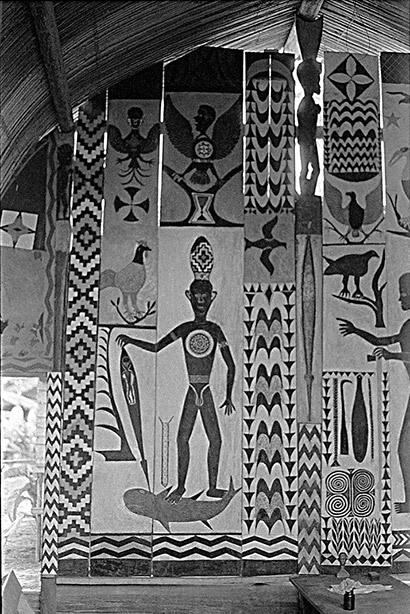 During the 1970s, Australian-born artist and teacher Marilyn Havini worked closely with Gregory Dausi Moah in a program aimed at introducing students at Hutjena High School on Buka Island to traditional cultural practices. Havini describes Moah as a strong cultural man, recognised as one of the region’s most significant artists. 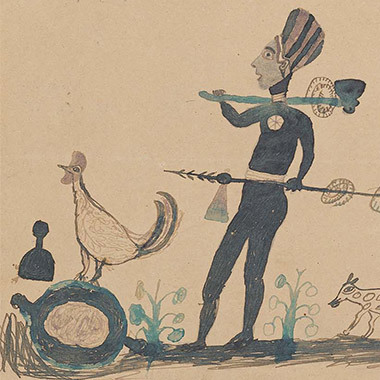 These two drawings were completed while Moah lived with Havini and her Buka-born husband Moses on Sohano Island. Emerging from passionate conversations about culture and identity, the works record traditional practices that were in rapid decline or had been lost. 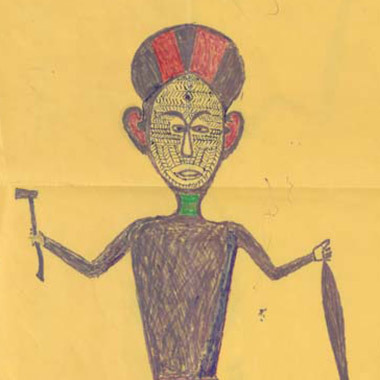 Like Somuk, Moah was concerned by this and chose to document the North Bougainville practice of wearing the iconic Upe headdress as part of a boy’s initiation into manhood. This drawing records the low dome-shaped structures made by men throughout Buka Island and North Bougainville as clan houses. Known as Tsuhana, these dwellings are the central authority and collective power base of a clan. The architecture is held up by three main posts often carved with tribal totems and other significant historical figures. Slit drums are placed on the front corner of the Tsuhana, and all tribal ceremonies, from bride price rituals and funerals to meetings called by chiefs, are performed here, accompanied by the resonant beat of drums. 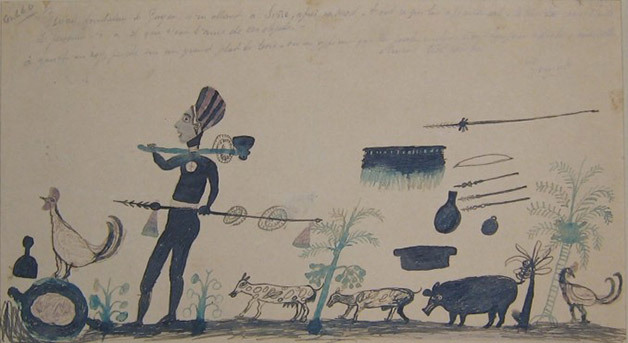 In Moah’s drawing, the drums are sounding and men are carrying in food and buai (betel nut) required for ceremony. During the early 1970s, Chief Moah created a Naboin tribe Tsuhana (clan house) on the sacred site of Peit, in the Gagan area of Solos on Buka Island, where all of the region’s tribes are believed to have migrated from. 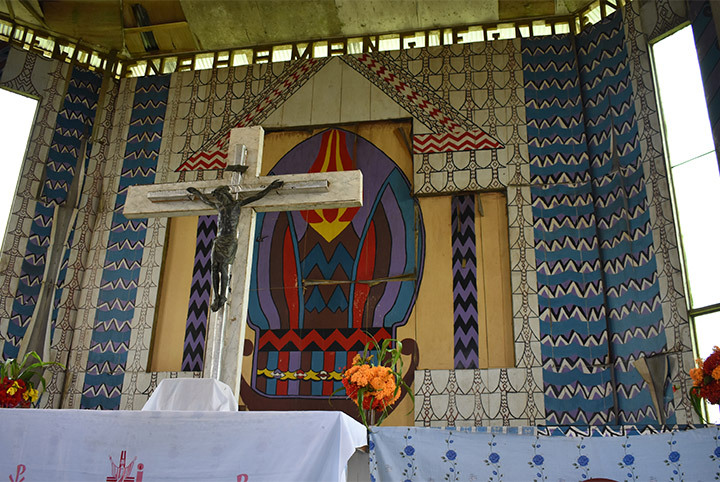 The Tsuhana was built between 1974 and 1976 as an exercise in cultural revival organised by the first provincial government in Bougainville — the North Solomons Provincial Government. Storyboards and carvings lined the interior, depicting legends of not only the Solos area but also of the whole of Buka Island. The Tsuhana was the frontage of the Peit Community Government Village Assembly, opened on 1 September 1976. This brightly coloured storyboard from Chief Moah’s Tsuhana (clan house) in Solos depicts the traditional spirit figure Roko with a kapkap (shell ornament). 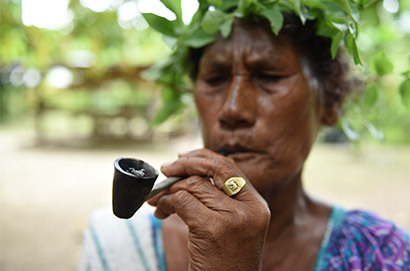 The omnipresent Roko is common across all of Buka Island and North Bougainville, and each of the region’s four clans — Naboin, Nakaripa, Nakas and Natasi — have their own Roko spirits. Moah’s Roko figure wears a kapkap traditionally worn by chiefs on their chests and foreheads as symbol of authority. The kapkap is an intricately carved turtle-shell disc mounted on nacre (white mother-of-pearl shell). 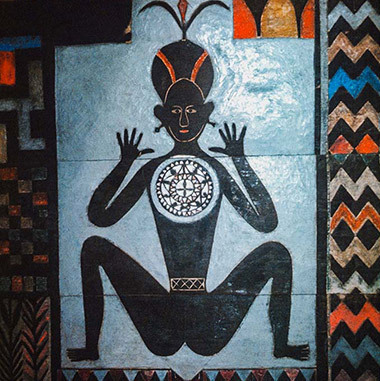 The central motif of the kapkap identifies its bearer and clan. 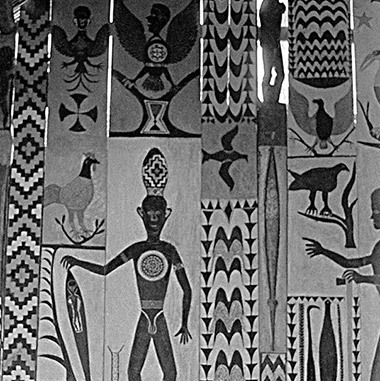 A prominent feature of Chief Moah’s Tsuhana were two large storyboards carved in bas-relief. 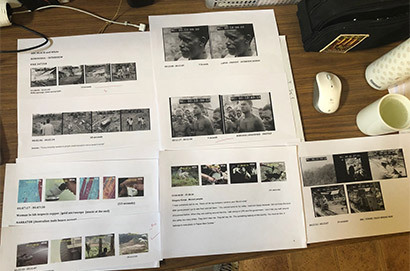 The first man and first woman in the oral history of Buka and North Bougainville appear in the right of this storyboard. On the left is the firstborn Naboin son Guérian riding a shark — symbol of his power and of nature. The relative sizes of the figures indicate their importance in the story. The Asia Pacific Triennial of Contemporary Art (APT) was initiated by the Queensland Art Gallery in 1993 to focus on the extraordinary contemporary art of Asia, the Pacific and Australia. APT is the Queensland Art Gallery | Gallery of Modern Art’s most internationally recognised contemporary art project. The exhibition’s immediate audience has grown from 60 000 in 1993 to more than 600 000 in 2015, and the opportunities it provides for scholarship, cultural dialogue and engagement with diverse communities are similarly expansive. Exploring contemporary practices in Asia, the Pacific and Australia forms the basis of the Triennial’s curatorial framework, which continually questions definitions of contemporary art, the geography inferred by the exhibition’s title and the context and relevance of art in different societies throughout the region. APT is noted for engaging audiences in significant and innovative practices from the Asia Pacific. Women’s Wealth is a major project commissioned for APT9. 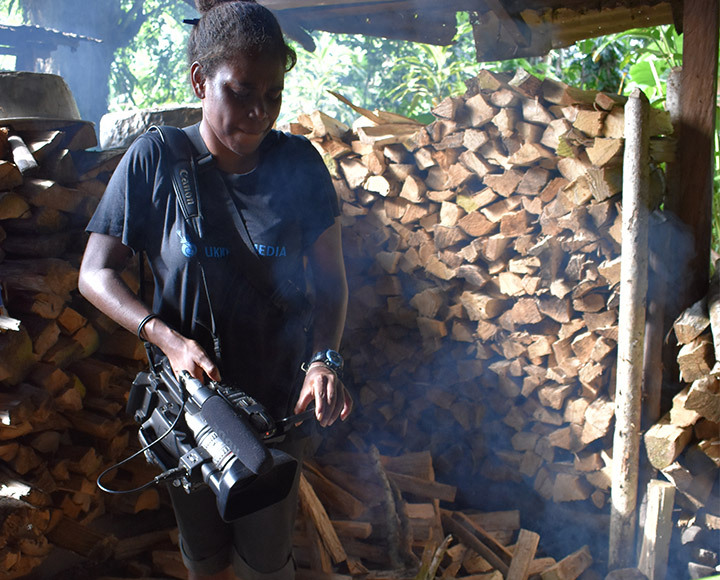 The project draws its title from anthropological debate in the 1970s over the value of women’s material cultural practices in Papua New Guinea. 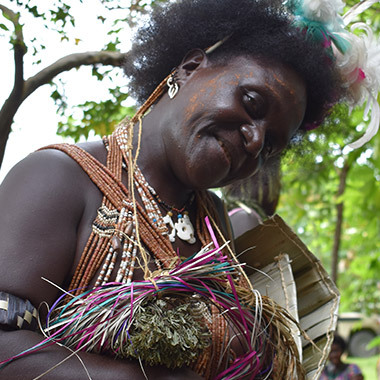 Some 40 years later, Women’s Wealth celebrates women’s material culture in Bougainville and nearby Choiseul and Shortlands Islands. 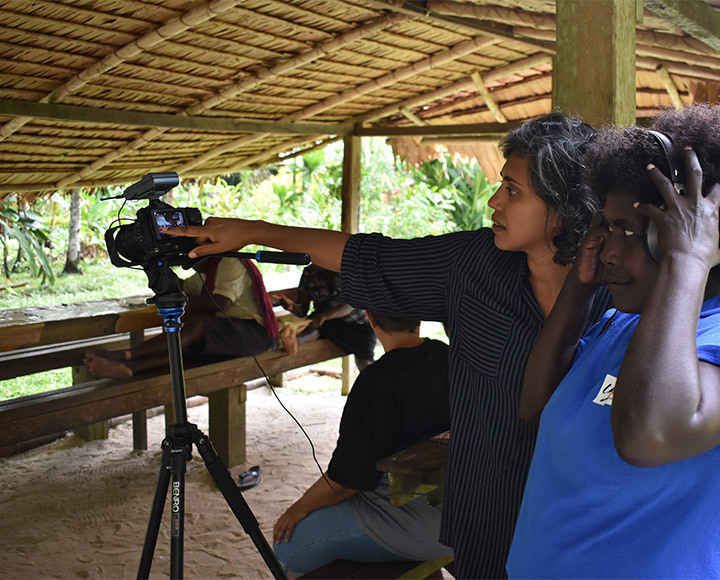 New voices are drawn into the story to explore connections between these practices and the indigenous knowledge and governance systems of the Bougainville and Solomons people. 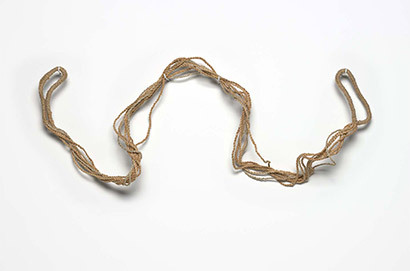 Objects created by women in groups are valued not only for their aesthetic beauty but also the connections they enable with the land and kin, both living and deceased. The work resists forces of alienated labour, mechanised production and environmental destruction that have had such a devastating impact on this region. In addition to being significant forms of cultural and artistic expression, the works in Women’s Wealth are statements of cultural resilience and pride. 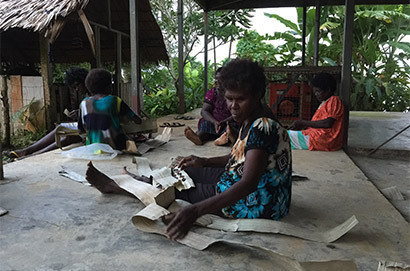 Women’s Wealth is supported by the Australian Government through the Australian Cultural Diplomacy Grants Program of the Department of Foreign Affairs and Trade, the Gordon Darling Foundation, the Brisbane Bougainville Community Group Inc., the Cairns Bougainville Association, QUT Creative Industries and Queen Emma Chocolate Company. 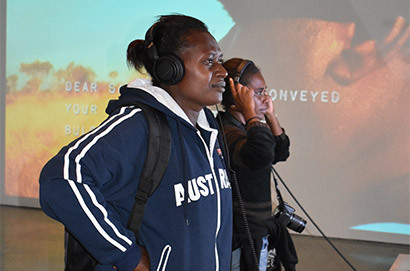 The Solomon Islands artists’ participation was supported by QAGOMA’s Oceania Women’s Fund, enabled by the generous bequest of Jennifer Phipps. Special thanks to the artists and their families. Also, the Hon. Josephine Getsi, Minister for Community, Women and Culture, Autonomous Region of Bougainville Government; Cameron Darragh, Joanna Stratton, Joanna Larvin and Roselyne Kenneth, Australian High Commission, Port Moresby; Dorcas Gano, President, Hakö Women’s Collective; Sister Lorraine Garasu and staff of the Nazareth Rehabilitation Centre; Alisa Vavataga and Qila Tuhanuku, Solomon Islands Art Alliance; Nelly Neko and Mary Kereseka, Choiseul Provincial Council for Women; Brian Tutura, NID office; Elsie Kipau; Peter Siuani and family; Joe and Anna Kevi; Edward and Emelda Bukil; Veronica and Les Henderson; Rod and Kama Pearce; Carol and Joe Golu; Lazaros Kastanis, Amanda Howes and Darren Pack, Ortelia Interactive Services; Natasha Harth, Morgan McGuire, Mark Gomes and John Marshall, QAGOMA and the extended Havini and Balai families. Photographs courtesy: Taloi Havini; Ruth McDougall; Sana Reana Balai, Amanda King, Kay Lawrence, Michal Kluvanek and Bruce Mallar. All artwork photography courtesy of the artists and QAGOMA. Photographs: Natasha Harth.